The “Volunteer Vacation” concept is a very good mix of work and fun that fosters interaction with the indigenous population, with the members of our group and of course with the staff of Tandana. 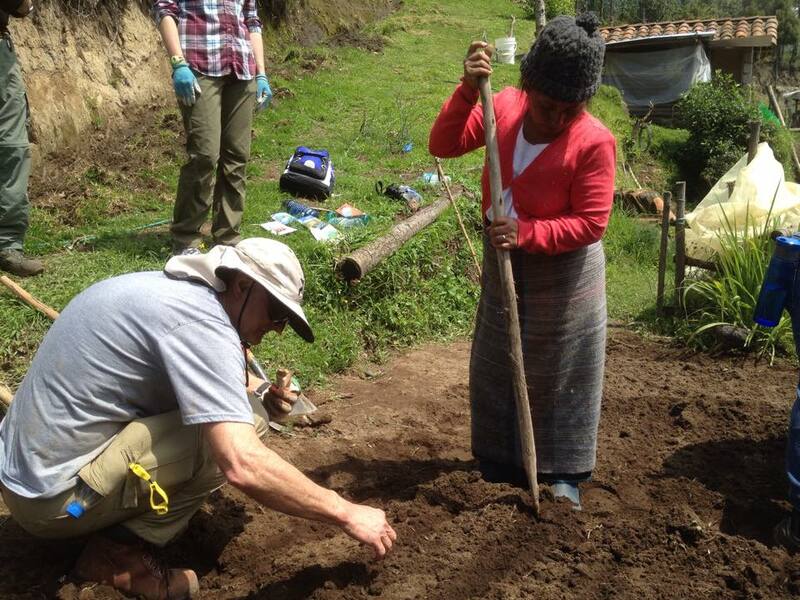 Our week in Otavalo was interesting, enjoyable, rewarding and fun. During our time there we planted tree seedlings to alleviate an erosion problem along the side of a new roadway; helped a Kichwa family create new garden space on a hillside while using their tools (which included an outsized hoe and rake unlike any size I have seen in my part of the world); at the co-operative Kichwa nursery we weeded, prepared seed-starting pots, and back-filled a ditch for a black-water drainage pipe; we prepared a garden plot for an elementary school, and had some very entertaining (for us, anyway) interactions with the children there. But it wasn’t all work – that’s what we did in the mornings. 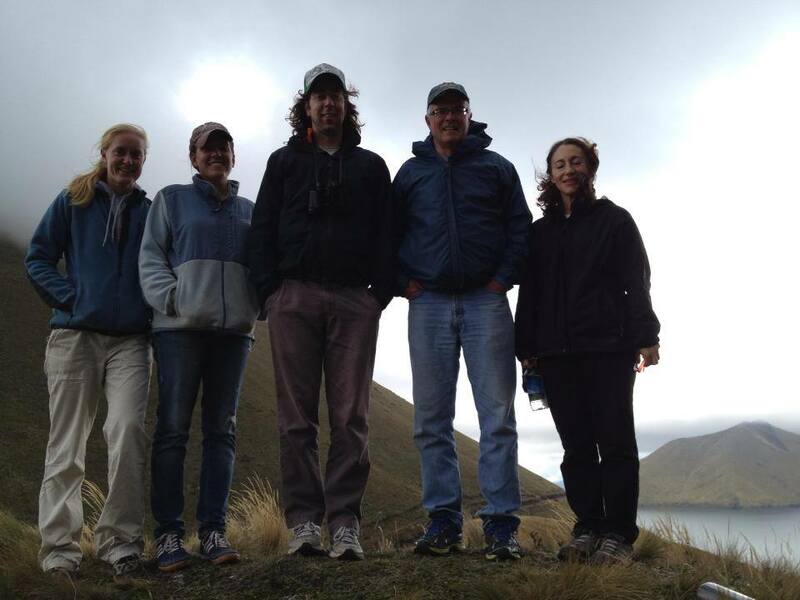 In the afternoons and evenings, we shopped and haggled at the famous outdoor market in Otavalo; we joined in a community lunch in the countryside with the rural Kichwa; we stopped at the rim of a collapsed volcano (Cuicocha) and awed at the islands and lake that formed there; we savored lunches and dinners at very good restaurants in Otavalo; we had a behind-the-scenes tour of a rose plantation led by the plantation manager; we went to a cooking school and learned to cook delicious local foods Kichwa style; we had an in-depth tour of a small organic farm called La Amistad, led by the very engaging proprietor, Shelly Caref; and we had a delightful dinner at the mountain-side retreat, Casa Mojanda. The Tandana staff treated us to excellent coordination of the schedule, contributing to make both the work and play of our stay enjoyable. Transport, whether by bus, taxis, or pickup trucks as the situation called for, was appropriate and on time. And the weather was serendipitously perfect – the forecasts I saw called for rain every day, but as it turned out, it rained only briefly and mainly at night, and the days were sunny and warm. I awarded the entire trip a well-deserved five-star rating (out of five). El concepto de “Las Vacaciones de Voluntariado” es una mezcla excelente de trabajo y diversión, que fomenta la interacción entre la población indígena, los miembros de nuestro grupo y sin duda el personal de Tandana. Nuestra semana en Otavalo fue interesante, agradable, gratificante y divertida. Durante nuestra estancia allí plantamos plántulas para paliar un problema de erosión junto a una nueva carretera; ayudamos a una familia quechua a crear un jardín nuevo en la ladera, a la vez que utilizábamos sus herramientas (las cuales incluían una azada y un rastillo gigantes como nunca jamás había visto); en el vivero cooperativo de los quechua quitamos las malas hierbas, colocamos macetas con semillas; y rellenamos una acequia para una tubería de drenaje de aguas residuales. Preparamos una parcela de jardín en una escuela primaria; y tuvimos algunas interacciones muy divertidas (al menos para nosotros) con los niños de allí. Sin embargo, no todo fue trabajo – eso es lo que hicimos por las mañanas. 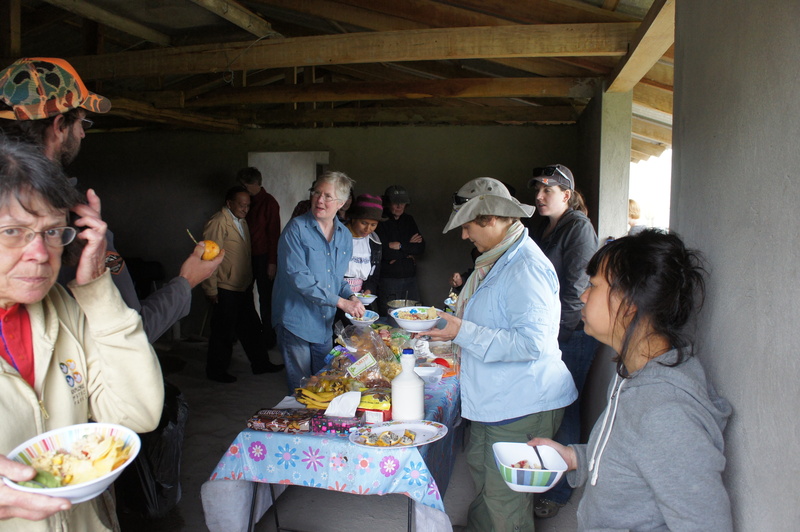 Por las tardes y las noches, compramos y regateamos en el famoso mercado al aire libre en Otavalo; participamos en un almuerzo comunitario en el campo con los quechua rurales. 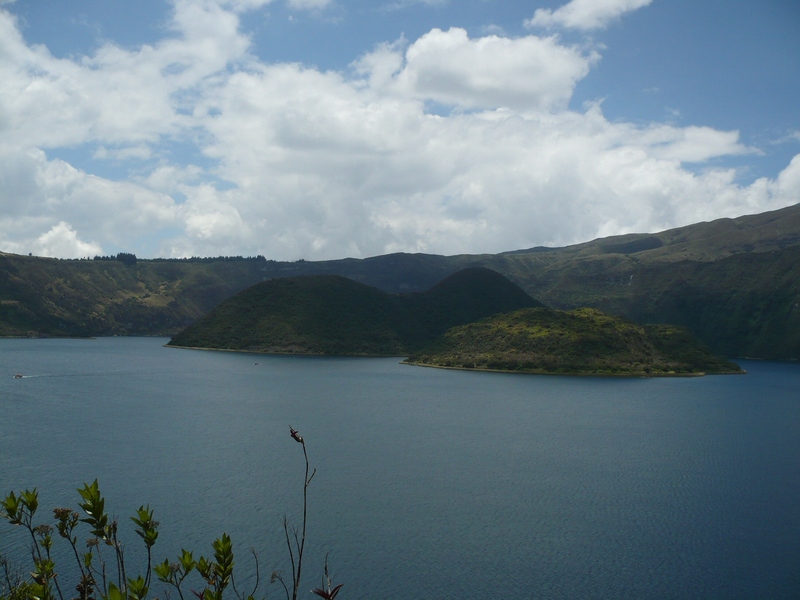 Paramos al borde de un volcán derrumbado (Cuicocha) y admiramos las islas y el lago que se formaron allí. 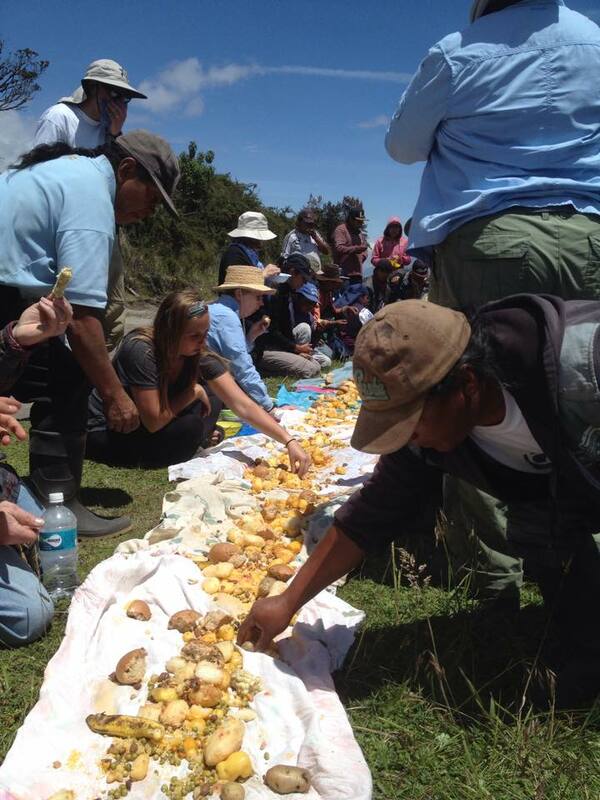 Saboreamos comidas y cenas en restaurantes muy buenos de Otavalo; hicimos un recorrido entre bastidores por una plantación de rosas guiada por el director de la plantación. 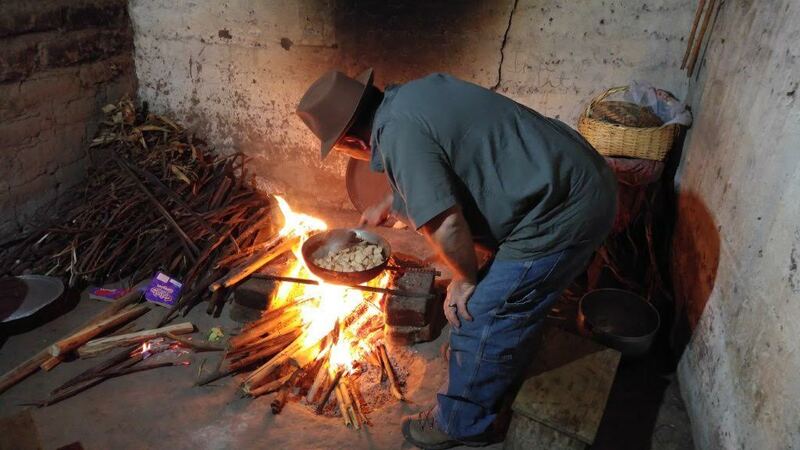 Fuimos a una escuela de cocina y aprendimos a cocinar comida local deliciosa al estilo quechua. 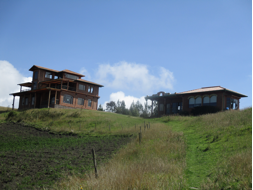 Hicimos un recorrido a fondo por una pequeña granja orgánica llamada La Amistad, guiada por su encantadora propietaria, Shelly Caref; y tuvimos una cena exquisita en un retiro en la montaña, Casa Mojanda. El personal de Tandana nos trató con una excelente coordinación del programa, y contribuyó a que el trabajo y la diversión durante nuestra estancia fueran agradables. El transporte, ya fuera en autobús, taxis o camionetas, según la situación, fue adecuado y puntual. Además el tiempo fue casualmente perfecto – los pronósticos que vi anunciaban lluvia todos los días, pero resultó que solo llovió un poco y principalmente por la noche; y por tanto, los días fueron soleados y calurosos. Le otorgué a todo el viaje una bien merecida calificación de cinco estrellas (de cinco). Le programme « vacances-bénévolat » permet d’allier parfaitement travail et plaisir mais aussi de développer des échanges avec les populations indigènes, les membres de notre groupe et bien sûr le personnel qui travaille pour la Fondation Tandana. Notre semaine à Otavalo fut très intéressante, agréable, gratifiante et amusante. Durant notre séjour, nous avons planté des semis d’arbres afin de résoudre un problème d’érosion le long d’une nouvelle route; nous avons aidé une famille Kichwa à aménager un nouveau jardin situé sur le flanc d’une colline, nous avons utilisé leurs outils (une binette et un râteau d’une taille jamais vue dans la partie du monde dans laquelle je vis; à la pépinière coopérative de Kichwa, nous avons désherbé, préparé des plantules en petits pots et rempli un fossé pour un tuyau d’évacuation des eaux usées; nous avons également aménagé un potager pour une école primaire et nous nous sommes bien amusés avec les enfants là-bas. Bien sûr nous n’avons pas passé tout notre temps à travailler. Le travail c’était principalement le matin. L’ après-midi et le soir, nous faisions les boutiques et nous marchandions avec les commerçants du marché très connu d’Otavalo. nous nous sommes joints à un déjeuner communautaire dans la campagne, avec la population rural de Kichwa; nous nous sommes arrêtés au flanc d’un volcan effondré (Cuicocha) et nous nous sommes émerveillés devant les îles et les lacs qui se sont formés là, nous avons savouré des plats dans de très bons restaurants à Otavalo, le manager dune plantation de roses nous a offert une visite guidée, nous sommes allés dans une école de cuisine et nous avons appris à cuisiner des plats typiques, façon Kichwa; nous avons également visité une petite ferme organique qui s’appelle La Amistad et qui est dirigée par Shelly Caref, un proprietaire très attachant, enfin nous avons paisiblement dîné dans un restaurant situé sur le flanc d’une montagne appelée Casa Mojanda. Le personnel de la fondation Tandana a très bien organisé notre emploi du temps ce qui nous a permis d’apprécier au maximum notre travail et notre temps libre durant notre séjour. Le transport, imposé par la situation et qu’il soit par bus, taxi ou camionnette, fut bien choisi et toujours à l’heure. Quant au temps, il fut par un heureux hasard excellent-les prévisions météorologiques avaient annoncé de la pluie tous les jours mais en réalité il n’a plu que très peu et principalement la nuit, les journées furent ensoleillées et chaudes. J’ai décerné à tout le voyage cinq étoiles (sur cinq), amplement méritées. 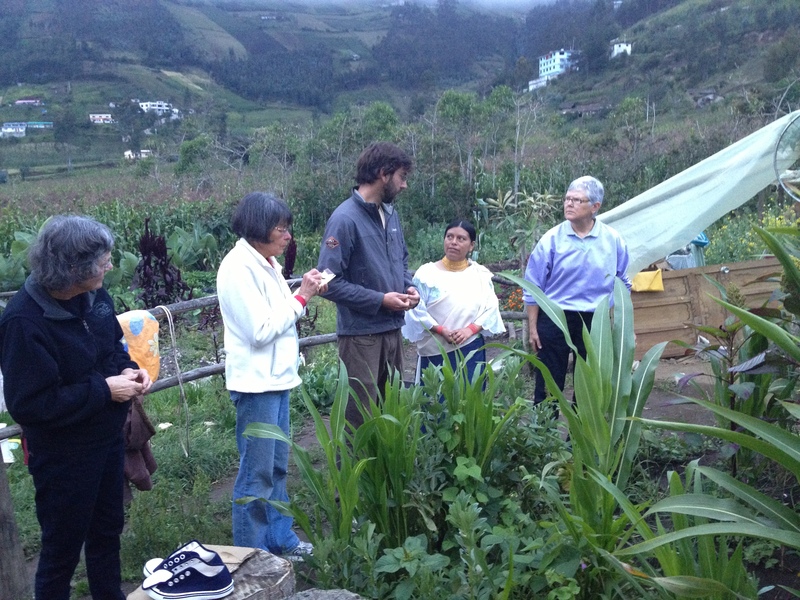 It’s been 4 days so far in Otavalo with Tandana for a gardening volunteer vacation and it’s been a whirlwind of new information, an onslaught to the senses, and an overwhelming level of immediate friendship among the 13 gardeners and gardening enthusiasts involved. The first day was a day of orientation, a visit to the famous Otavalo open air market, and some lessons on the culture, the language, and our first group dinner. For some of us, the market was our first experience with “haggling” to any great extent and some were much more successful than others and had to share our methods for future use. We awoke on day 2, Sunday, for our first ride to the vivero (nursery/greenhouse) and our first meeting with Matias who presides over the general operations of the vivero. The views kept many of us mesmerized for the ride to 10,465’ of elevation. We were doing our best to practice the phrases and language translations that Tyler (Tandana intern) was so skilled in giving us. Volunteer Mike promptly began creating mnemonics for some of the phrases that we found difficult to cement to memory. Such as when walking along a path and getting bored, creating a yawn then being struck by lightening thus became a shocking-yawn = chaquiñan, which is a footpath. No one ever said the language was going to be an easy part of the adventure! 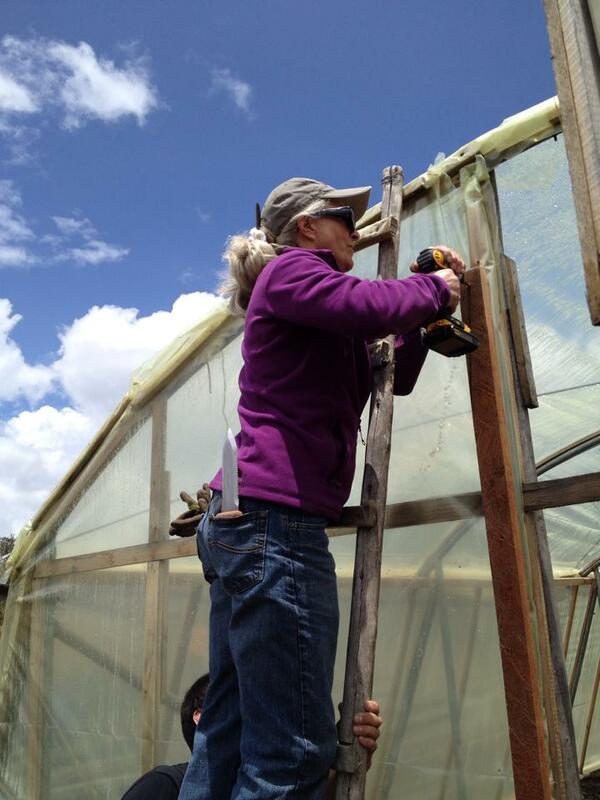 At the vivero, we weeded beds, weeded seedlings, reinforced the greenhouse, and learned how to function without passing out at +10,000’ for the first time . 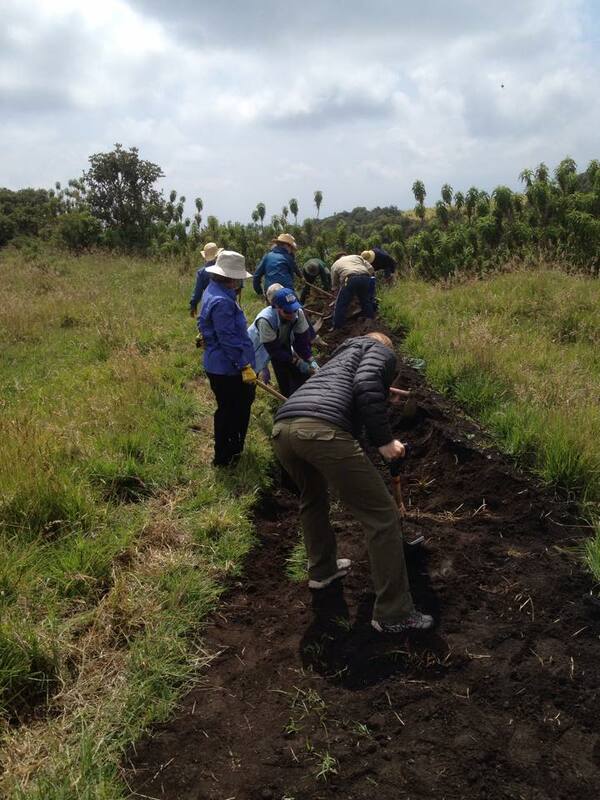 A crew of 4-5 highly capable women pulled some of the most intense grass we’ve ever seen from the topsoil mounds that Matias uses for potting trees. 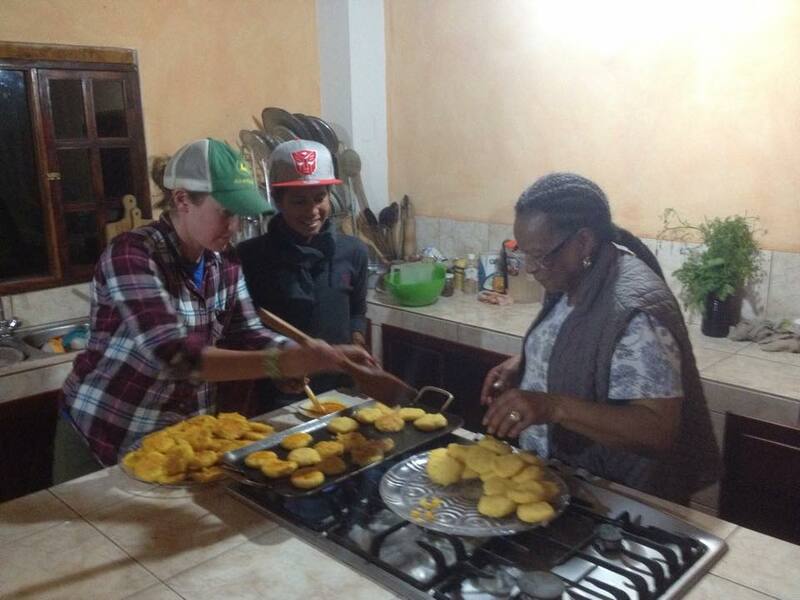 The afternoon and evening we spent at a cooking school run by a previous Tandana scholarship recipient named Claudia who taught us local recipes, helped us understand some of the local herbs, fruits, and vegetables that are used in every household in the area. During one point in the evening after the fantastic meal was consumed, volunteers Brenda and Irene were discussing a substitution for guinea pig in Claudia’s cookbook with Claudia. Brenda suggested that rabbit might work. Claudia’s horrified reaction to the consumption of rabbit was only reinforced as Irene stated that they eat rabbit in many French dishes and Brenda stated that her son hunted wild rabbit. 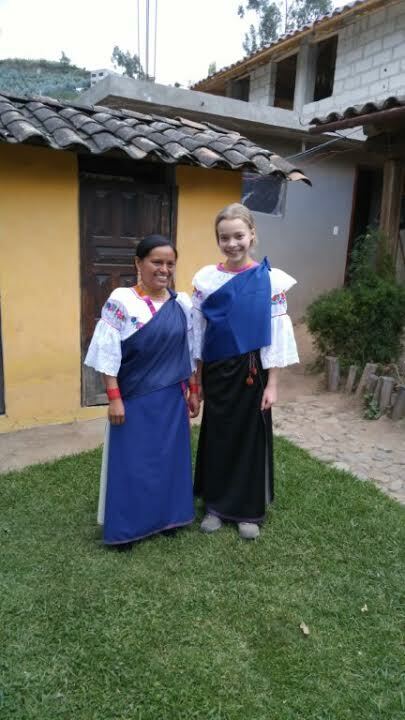 Claudia stated that they NEVER eat rabbit in Ecuador and was completely stunned that we do in the United States. The horrification continued as volunteer Natasha came into the kitchen and proceeded to imitate a bunny ears and hop for Claudia who began to laugh uncontrollably because she realized that she thought that we were eating RATS and not the rabbit as suggested. The confusion became clear and laughter brought all 4 women to tears at the thought that we were hunting and eating rats and that the French had really made it popular. On day 3 we loaded our trusty bus and headed to the village of Muenala to plant trees and work with their local officials. We scurried along amazingly steep slopes at 11,500’ to dig holes and plant 500 acacia trees wherever the president of Muenala directed us to. Volunteer Steve proclaimed he would dig 100 holes and most all of us are certain he succeeded! After 4+ hours of digging we were treated to a fantastic communal meal with the village officials. Just as we were finishing and ready to load the bus back down the mountain, the clouds began to roll in and shrouded our location in a peaceful white blanket. Before ending the day we had a most interesting visit with traditional healer, Abuelita, age 93. She healed volunteer Hope and gave direct orders for the note taking of many healing remedies for various ailments at the entertainment of everyone including Tandana founder Anna. The group was also given strict instructions as to the herbs they should have brought down from the mountain that day but did not! Day 4 took us up to the hills around Otavalo where we cut suckers off Alder trees for Matias to use for propagation. Steve became the climber of the ladder to reach the highest possible suckers and increase the count for Matias. Lunch was another fantastic meal at Claudia’s where we dined on more traditional foods along with adding popcorn to our soup instead of crackers as we would in the US. We ended day 4 with a trip to Cotacachi and the streets filled with leather stores and a wonderful meal at a local restaurant. 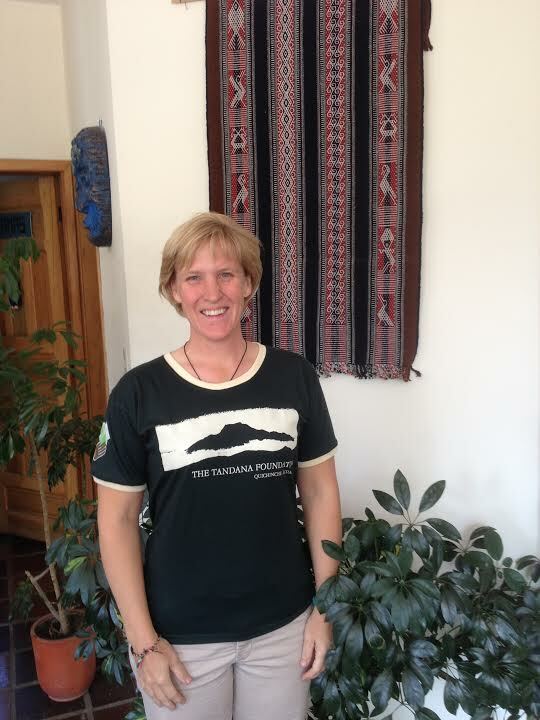 Back at the Quinde, Claire was noted as being 100% correct, Mike provided us a preview of his video on the importance of proper hydration at altitude, and volunteer Shyamala renamed Claire to be forever Clarita. We have 3 more days ahead and we are all sure that it will be nothing short of memorable and hilarious. 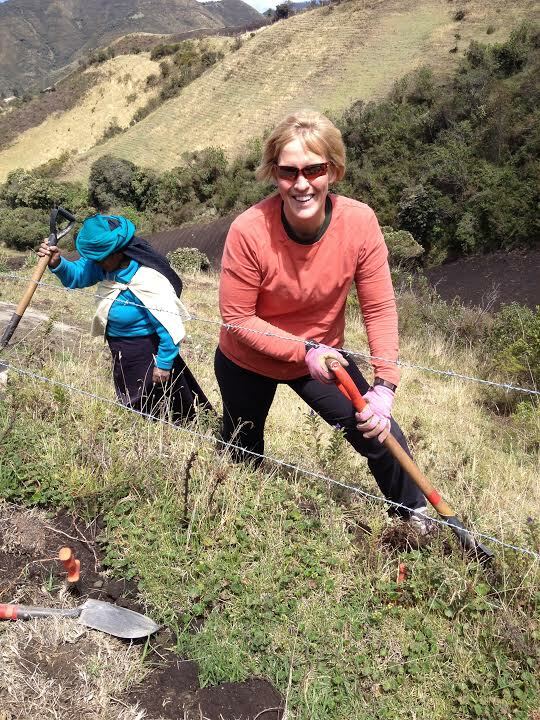 Tuesday began busily in the hills around Otavalo in Panecillo where we cut suckers from Alder trees that Anna planted in 1999 during one of her first projects in the area. Matias demonstrated the proper technique and quality of cuttings he desired and we were able to cut 750 pieces that he then rooted into pots at the vivero. We spent the afternoon and evening at the town of Cotacachi and the land of amazing leather stores. If you love quality leather goods (purses, jackets, shoes, etc.) be sure to bring an extra $100+ because it’s amazing quality but not inexpensive for such beautiful items. Be sure to get some incredible coffee to take home at the Café Intag store right off the town square and visit the gift shop to the left for some quality hand made items by a wonderful woman. 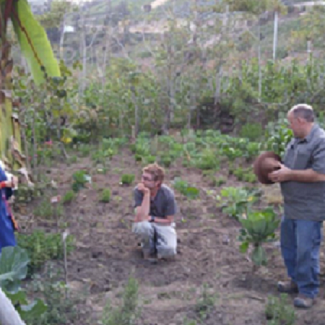 Wednesday’s adventure took us by bus to the Guachinguero school where some of us helped in the school garden and some of us worked with three boys, ages 10-12 on planting quinoa on a near vertical slope next to the school. 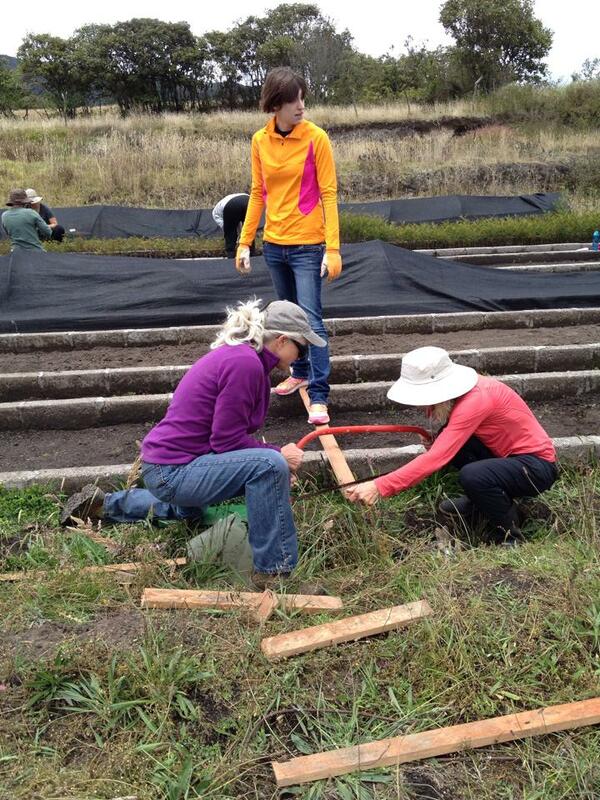 Using traditional hoes, 4 American women scattering seeds could not keep up with 3 boys hoeing the side of that hill! 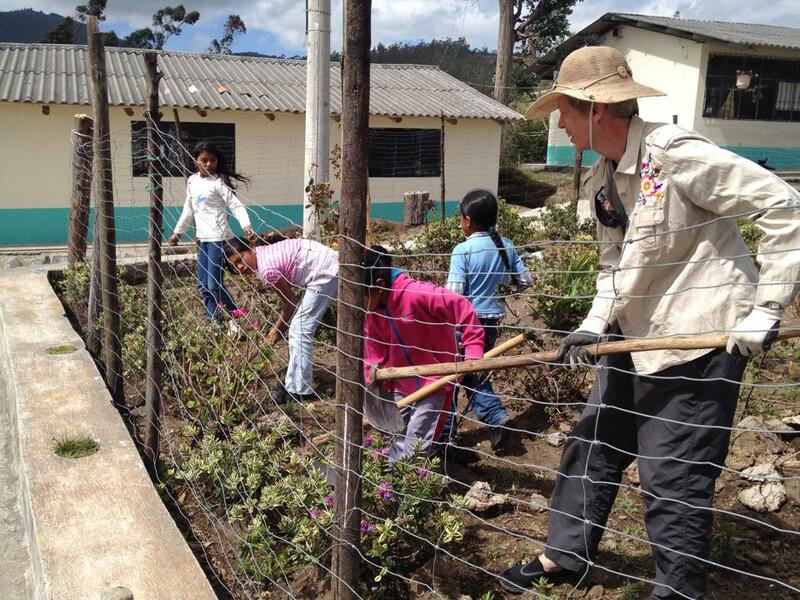 In the school garden, flowers were moved, shrubs were moved, and a hedge of lantana were planted around the border. The size of the grubs in the soil amazed many of us including the one that was larger than our thumbs. After the gardening and planting was finished, the children were broken out into 3 groups by grade and rotated through 3 different gardening sessions. One group developed a program to demonstrate the available water in the world using an apple, one group demonstrated seed starting in the shell of a mandarin orange, and the third group demonstrated the ease of composting. The teacher was so impressed with the compost lesson she has stated that she will be finding a location to compost what the school produces. Lunch was a fantastic meal of traditional quinoa soup made by one of the school moms. Her hand carved wooden ladle could strike fear into misbehaving children everywhere. 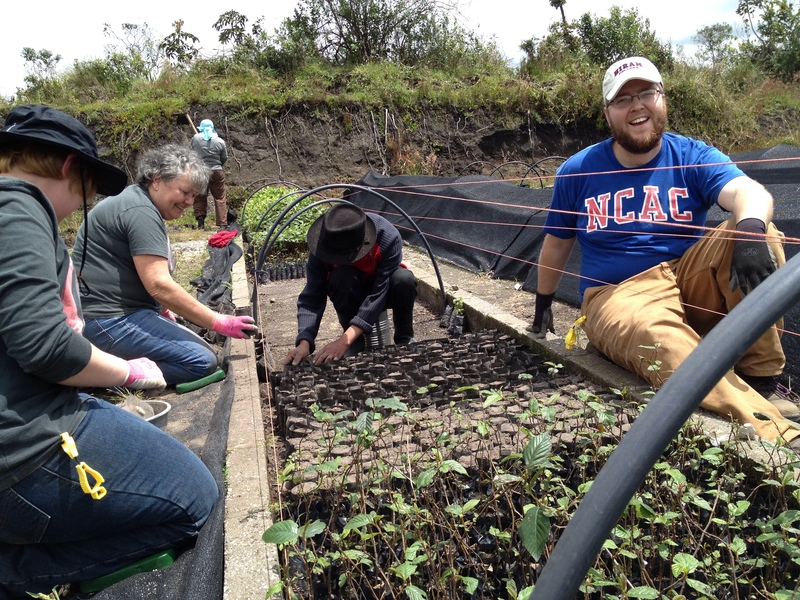 On Thursday, Matias was happy to have us return and help fill the new bed inside the greenhouse with potted seeds while others of us continued pulling weeds from the many potted trees outside. We presented him with the news that the group pooled their money to purchase windows for his new building and Debbie gave him a hammer, handsaw, and retractable tape measure, which left him speechless. He was most grateful he won’t have to use a rock to pound things in anymore! 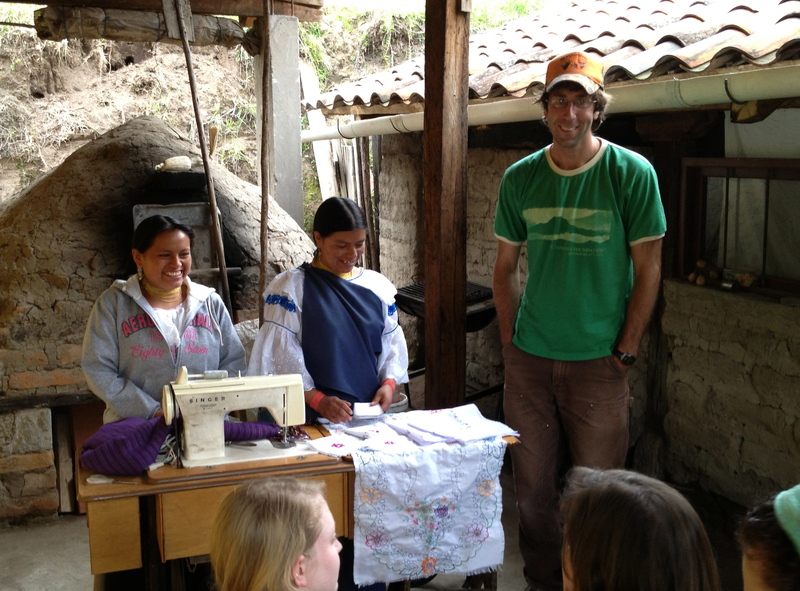 We went to witness the unbelievable skill of the Master Weaver Miguel. From sheep to loom, we were able to see the whole process. Bring some extra cash for this visit as well because his incredible pieces are irresistible but range in price from $10-$500. If you are staying at Maggie’s hotel (La Posada del Quinde), she has many of his pieces on display for sale. We wrapped up the evening with an incredible meal at Puerto Lago and the giving of our official Tandana volunteer t-shirts along with some incredible heartfelt words from the staff. We are all touched by what they said about each of us and could never believe that so much talent lies within the capable hands of the Tandana interns. Today is Friday and we are packing and loading for a stop at the actual equator (not the tourist spot), a picnic lunch, a visit to the orchid grower in Quito and then dinner as we all start to part ways. 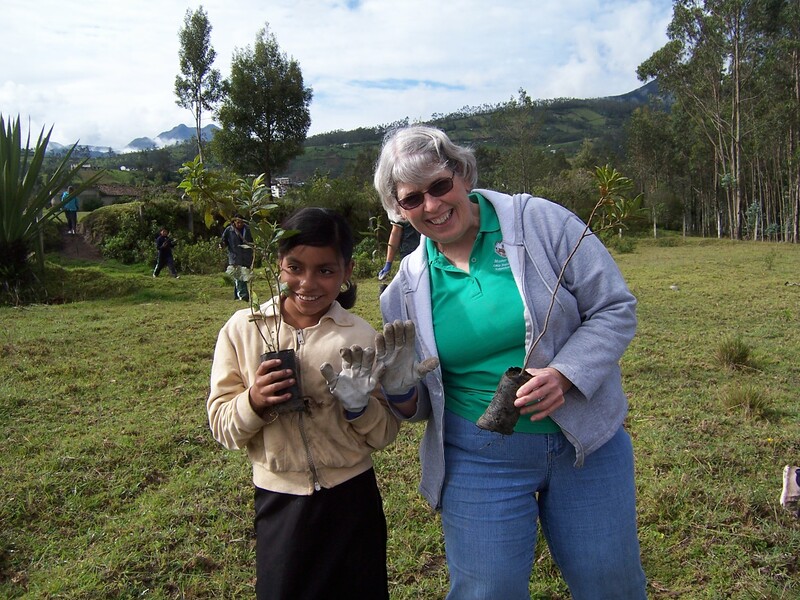 These type of volunteer vacations are not for everyone but everyone that participates goes home with more than they ever imagined and grows in ways they never expected. Sign up, you won’t ever regret it. 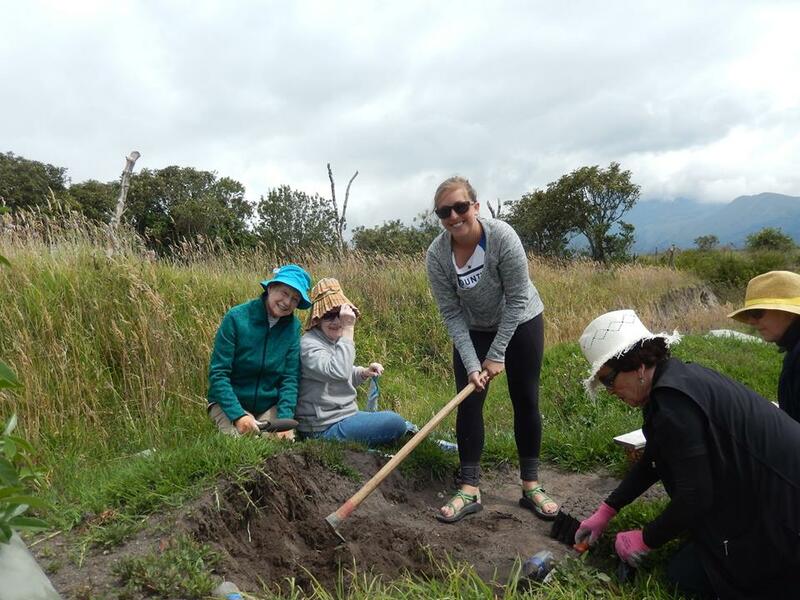 Apenas han pasado cuatro días en Otavalo con Tandana de las vacaciones de voluntariado de jardinería y ha sido un torbellino de nueva información, una arremetida para los sentidos, y un nivel abrumador de amistad inmediata entre los trece jardineros y los apasionados por la jardinería involucrados. El primer día fue la orientación, una visita al famoso mercado de Otavalo y algunas lecciones de cultura, idioma, y nuestra primera cena de grupo. Para algunos de nosotros el mercado fue nuestra primera experiencia con el regateo hasta cierto punto; algunos tuvieron más éxito que otros y compartieron sus métodos para usarlos en el futuro. Nos despertamos el segundo día, domingo, para nuestro primer viaje al vivero y nuestra primera reunión con Matías, quien preside las operaciones generales del vivero. Las vistas nos dejaron fascinados a la mayoría por el trayecto a 10.465 pies de altitud. Hacíamos lo mejor que podíamos para practicar las frases y traducciones que Tyler (pasante de Tandana) nos había dado tan hábilmente. El voluntario Mike inmediatamente comenzó a crear estrategias nemotécnicas para algunas de las frases que encontrábamos difíciles de retener en la memoria. Tal como cuando caminábamos por el camino y nos aburríamos, bostezábamos, luego éramos golpeados por una tempestad; de este modo se convirtió en un impactante-bostezo = chacquinan el cual significa sendero. ¡Nadie dijo que la lengua iba a ser una parte fácil de la aventura! En el vivero, sacábamos la mala hierba de los lechos y de las plantas del semillero, reforzábamos el invernadero, y aprendíamos cómo trabajar sin desmayarnos a más de 10.000 pies por primera vez. Una cuadrilla de 4 ó 5 mujeres muy competentes sacó alguna de la hierba más intensa que jamás habíamos visto de los montículos de mantillo que Matías usa para plantar árboles. La tarde la pasamos en la escuela de cocina dirigida por una antigua becaria de Tandana llamada Claudia, quien nos enseñó recetas locales y nos ayudó a conocer algunas de las hierbas, frutas y verduras locales que se usan en cada hogar de la zona. Durante un momento de la noche después de que la fantástica comida fuera devorada, las voluntarias Brenda e Irene discutían con Claudia la sustitución del cuy en su libro de recetas. Brenda sugirió que el conejo podía servir. La reacción horrorizada de Claudia al consumo de conejo fue fortalecida mientras Irene afirmaba que en muchos platos franceses se come conejo y Brenda revelaba que su hijo cazaba conejos salvajes. Claudia manifestó que en Ecuador NUNCA comen conejo y que estaba totalmente estupefacta al saber que lo hacíamos en los Estados Unidos. El horror continuó cuando la voluntaria Natasha llegó a la cocina y empezó a imitar los saltitos y las orejas de un conejo para Claudia, quien comenzó a reír descontroladamente porque se dio cuenta de que había pensado que comíamos RATAS y no conejo como habíamos sugerido. La confusión se aclaró y la risa llevó a las cuatro mujeres a las lágrimas por la idea de que cazábamos y comíamos ratas y que los franceses lo habían hecho verdaderamente popular. El tercer día cargamos nuestro leal bus y nos dirigimos a la aldea de Muenala a plantar árboles y trabajar con los funcionarios locales. Nos apresuramos por laderas increíblemente empinadas a 11.500 pies para cavar agujeros y plantar 500 acacias a donde fuera que el presidente de Muenala nos dirigiera. El voluntario Steve anunció que cavaría 100 agujeros y casi todos estamos seguros de que lo consiguió. Después de más de cuatro horas excavando nos obsequiaron con una comida comunitaria fantástica con los funcionarios de la aldea. Justo cuando estábamos terminando y preparándonos para cargar el bus de regreso a la montaña, las nubes comenzaron a moverse y envolvieron donde nos encontrábamos en una apacible manta blanca. Antes de terminar el día tuvimos una visita más que interesante con una curandera, Abuelita (de 93 años). Ella sanó a la voluntaria Hope y dio órdenes directas para la toma de notas de muchos remedios curativos para varias dolencias para el entretenimiento de todos incluyendo la fundadora de Tandana, Anna. También nos dieron estrictas instrucciones sobre las hierbas que se deberían haber traído de la montaña aquel día pero no se hizo. El cuarto día nos llevó hasta las colinas alrededor de Otavalo donde cortamos retoños de alisos para que Matías los usara para la reproducción. Steve se convirtió en el escalador para alcanzar los más altos retoños posibles y aumentar el recuento de Matías. El almuerzo fue otra comida fantástica en la casa de Claudia donde comimos platos más tradicionales a la vez que añadimos palomitas a nuestra sopa en lugar de ‘crackers’ como haríamos en los EEUU. Terminamos el cuarto día con un viaje a Cotacachi y las calles llenas de tiendas de cuero y una comida maravillosa en un restaurante local. De vuelta en el Quinde, Claire demostró que tenía razón al 100%, Mike nos brindó con una vista previa de su vídeo sobre la importancia de la hidratación en alturas elevadas, y la voluntaria Shyamala renombró a Claire Clarita para siempre. Tenemos tres días más delante y todos estamos seguros de que será poco menos que inolvidable y divertidísimo. El martes comenzó afanosamente en las colinas que rodean Otavalo en Panecillo donde cortamos los retoños de aliso que Anna plantó en 1999, durante uno de sus primeros proyectos en la zona. Matías nos demostró la técnica correcta y la calidad de corte que el deseaba; fuimos capaces de cortar 750 piezas que después él enraizó en macetas en el vivero. Pasamos la tarde y la noche en la ciudad de Cotacachi y la tierra de las impresionantes tiendas de cuero. Si le gustan los productos de cuero de buena calidad (bolsos, chaquetas, zapatos, etc.) asegúrese de llevar unos 100 dólares extra porque son de una calidad extraordinaria, pero nada caros para artículos de tal belleza. Asegúrese de tomar el increíble café para llevar en la tienda del Café Intag junto a la plaza de la ciudad y visitar la tienda de regalos a la izquierda para comprar artículos artesanales de calidad hechos por una mujer maravillosa. La aventura del miércoles nos llevó en bus a la escuela de Guachinguero donde algunos de nosotros ayudamos en el jardín de ésta y otros trabajamos con tres niños de 10 a 12 años plantando quínoa en una ladera vertical colindante a la escuela. Usando azadas, ¡cuatro mujeres estadounidenses diseminando semillas no podían seguir el ritmo de los tres chicos cavando la ladera de esa colina! En el jardín de la escuela se trasladaron las flores y los arbustos, y se plantó un seto de lantanas alrededor del borde. El tamaño de las larvas en la tierra nos impresionó a muchos incluyendo uno que era más grande que nuestros pulgares. Después de terminar de plantar y el trabajo de jardinería, se separó a los niños en tres grupos por cursos y se les hizo rotar por tres sesiones de jardinería diferentes. Un grupo desarrolló un programa para demostrar el agua disponible en el mundo usando una manzana, otro demostró la semilla a partir de la cáscara de un tipo de mandarina, y un tercero demostró la facilidad de hacer abono. La maestra estaba tan impresionada con la lección de abono que aseguró que encontraría un lugar para convertir en abono lo que la escuela produce. El almuerzo fue una fantástica sopa tradicional de quínoa hecha por una de las madres de la escuela. 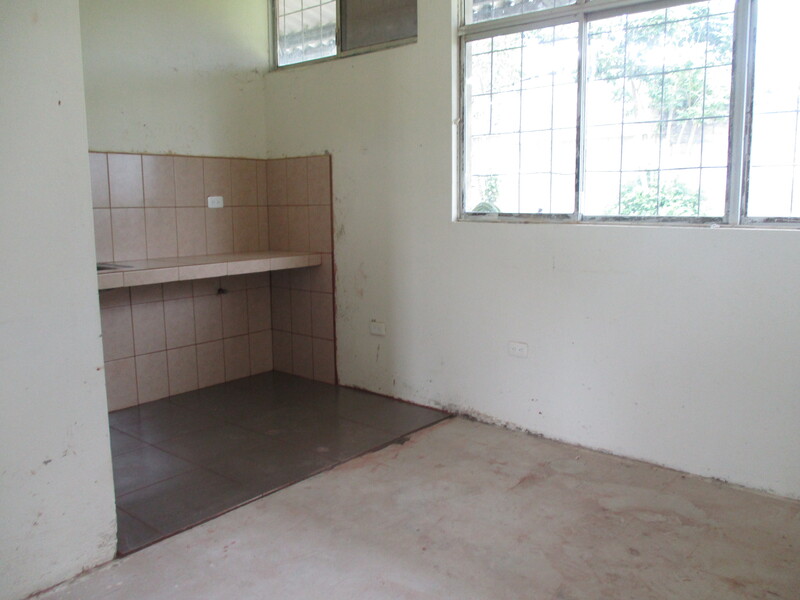 Su cacillo de madera tallado a mano podría atemorizar a los niños desobedientes de cualquier lugar. 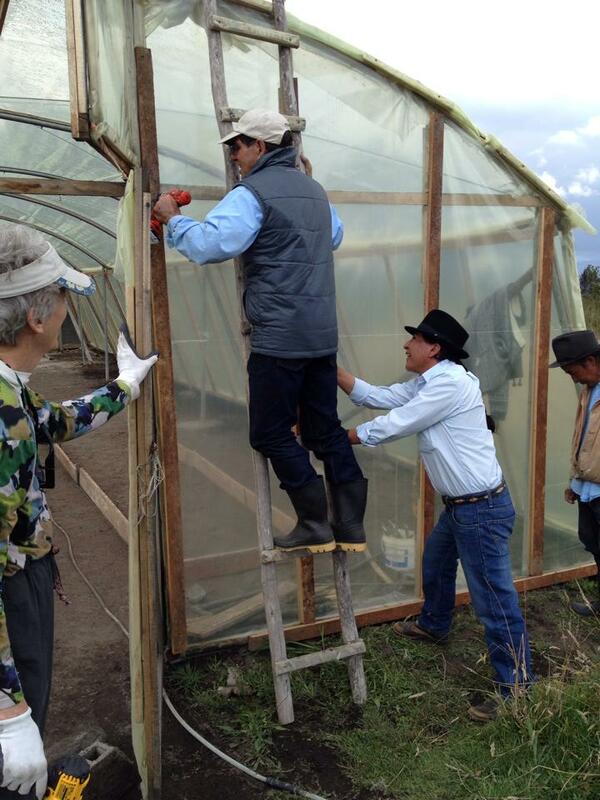 Por la tarde hicimos un tour al plantío de rosas de la granja Falcon en Otavalo. Consiste en una producción de 67 acres (27,1139 hertáreas) de rosas cubiertas por plástico en su totalidad, sistema completo de irrigación por goteo, y la Certificación de la Alianza de Selva Tropical al uso mínimo de pesticidas y herbicidas. Cada rizoma y variedad de rosal injertado produce rosas por un promedio de diecisiete años. ¡Cada acre de la plantación puede producir dos millones y medio de rosas al año! El gerente de la plantación fue completamente sensacional y cambió para siempre el nombre del fertilizante para rosas por el de Viagra rosa. El gerente gentilmente nos despidió con ocho ramos de rosas que incluían algunas para la voluntaria Thea de parte de su marido Steve en honor a sus bodas de oro. Los otros ramos fueron separados por los pasantes y entregados a sus madres de acogida; y un bouquet con la variedad preferida del gerente se le entregó a Maggie en nuestro hotel por toda su hospitalidad. El jueves, Matías estaba feliz de tenernos de vuelta para poder ayudar a rellenar el nuevo lecho dentro del invernadero con semillas en macetas mientras otros continuaron sacando las malas hierbas de muchos árboles en macetas afuera. Le informamos de que el grupo reunió su dinero para comprar ventanas para su nuevo edificio y que Debbie le daba un martillo, una sierra de mano, y una cinta métrica retráctil, lo cual le dejó sin palabras. ¡Él estaba más que agradecido de que ya no tendría que utilizar una piedra para pesar cosas nunca más! Fuimos a presenciar la increíble habilidad del Maestro Tejedor Miguel. Desde las ovejas hasta el telar, pudimos ver todo el proceso. Traiga algo de dinero extra para esta visita también porque sus extraordinarias piezas son irresistibles, pero su precio varía de 10 a 500 dólares. Si se hospeda en el hotel de Maggie, ella tiene muchas de sus piezas expuestas para la venta. Cerramos la noche con una comida increíble en Puerto Lago y la entrega de nuestras camisetas oficiales a los voluntarios de Tandana junto a algunas palabras sentidas del personal. Todos estamos conmovidos por lo que dijeron sobre cada uno de nosotros, y nunca podríamos creer que hubiera tanto talento dentro de las diestras manos de los pasantes de Tandana. Hoy es viernes y estamos empacando y cargando para hacer una parada en el ecuador real (no el lugar turístico), un almuerzo al aire libre, una visita al viticultor de orquídeas en Quito y luego la cena mientras todos comenzamos a separarnos. Este tipo de vacaciones de voluntariado no son para cualquiera, pero todos los que participan vuelven a casa con más de lo que jamás habían imaginado y crece en formas que nunca habían esperado. Ça fait 4 jours en Otavalo avec Tandana pour lesjardinages vacances bénévoles et il a été un tourbillon de nouvelles informations, une attaque des sens, et un niveau d’amitié complètement accablant entre les 13 jardiniers et les passionnés de jardinage impliqué. 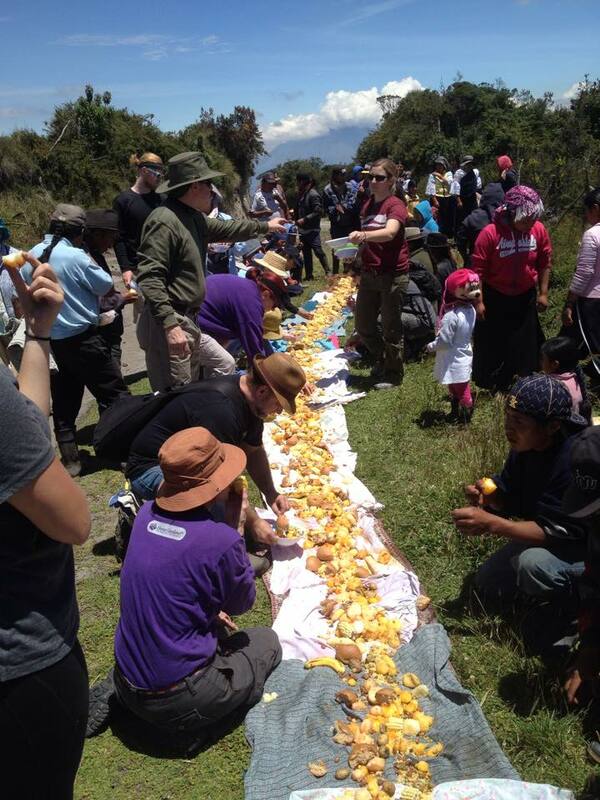 Le premier jour était le jour d’orientation, une visite au marché en plein air célèbre en Otavalo, et quelques leçons de la culture, la langue, et le premier dîner en groupe. Pour certains d’entre nous, le marché était notre première expérience avec « le marchandage » dans une grande mesure et quelques personnes avait beaucoup plus de succès que les autres et avait besoin de partager leurs méthodes pour utiliser à l’avenir. Nous nous sommes réveilles le 2eme jour, dimanche, pour notre premier tour au vivero (une pépinière/une serre) et notre première rencontre avec Matais qui préside sur les opérations générales du vivero. Les vues gardé beaucoup d’entre nous hypnotisé pour le tour de 10,465 pieds d’élévation. Nous faisons notre mieux de pratiquer les phrases et les traductions de la langue que Tyler (un stagiaire de Tandana) était si habile a nous donner. Mike le volontaire a commencé rapidement de créer moyen mnémotechnique pour certains des phrases que nous avons trouvées difficiles pour aider à mémoriser. Par exemple, lors de la marche le long d’un chemin, et s’ennuyer, en créant un bâillement et puis être frappé par la foudre est devenu un « un bâillement choquant » = chacquinan qui est un sentier. Personne n’a jamais dit que la langue allait être la partie la plus facile de l’aventure ! Au vivero, nous avons désherbé des plates-bandes, des jeunes plants, renforcé la serre, et appris à fonctionner sans perte de connaissance à 10,000 pieds d’altitude pour la première fois. Une équipe de 4-5 des femmes capables tiré une partie de l’herbe la plus intense que nous ayons jamais vu monticules de terre végétale que Matais utilise pour emporter les arbres. Cet après-midi et soirnous avons passé à une école de cuisine gérée par un bénéficiaire Tandana de bourse précédente qui s’appelle Claudia qui nous a appris les recettes locales, nous a aidés à comprendre certaines des herbes locales, des fruits, et des légumes qui sont utilisés dans chaque maison dans la région. Au cours d’un point de la soirée après un repas fantastique a été consommé, bénévoles Brenda et Irene discutaient une substitution pour le cochon d’inde dans le livre de cuisine de Claudia, avec Claudia. Brenda suggéré qu’un lapin était une possibilité. La réaction horrifiée de Claudia à la consommation de lapin n’a été renforcé parIrene quand elle a dit qu’ils mangent le lapin dans la cuisine française et Brenda a dit que son fis chasse des lapins sauvages. Claudia a dit qu’ils ne mangent jamais les lapins en Équateuret a été complètement abasourdi que nous les mangeons aux Etas Unis. L’horrification poursuivie comme bénévole Natasha est venu dans la cuisine et a procédé à imiterles oreilles de lapin et hop pour Claudia qui a commencé a rigoler parce qu’elle s’est rendu compte qu’elle a pensé que nous mangions des rats et pas des lapins ! La confusion est devenu clair et le rire a tous les 4 femmes aux larmes à la pensée qu’ils étaient à la chasse et à manger des rats et que les Français l’avait rendu populaire. Le troisième jour, nous avons chargé notre van fidèle et sont allés au village de Muenala à planter des arbres et travailler avec leurs fonctionnaires villageois. 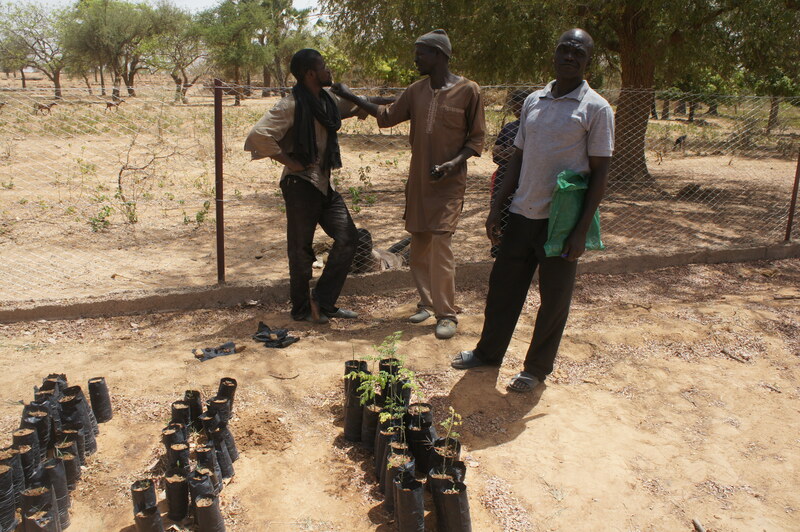 Nous nous hâtions le long de des pentes abruptes à 11,500 pieds pour creuser et planter 500 des arbres acacia où que le directeur de Muenala nous a indiqué les planter. Bénévole Steve a proclamé qu’il allait creuser 100 trous et la plus part d’entre nous sont certaines qu’il réussira ! Après 4+ heurs de creusement, nous avons eu un repas commun fantastique avec les fonctionnaires du village. Tout comme nous finissions et prêt à charger le bus vers le bas de la montagne, les nuages ​​ont commencé à rouler vers nous et enveloppées notre emplacement dans une couverture blanche. Avant la fin de la journée nous avons eu une visite intéressante avec un guérisseuse traditionnelle, Abuelita, agee de 93 ans. Elle guérit Hope et a donné des ordres directs pour prendre des notes de nombreux remèdes guérir pour les maladies divers, au divertissement de tout le monde, notamment la fondatrice de Tandana, Anna. Le groupe a également donné des instructions strictes des herbes qu’ils devraient avoir ramené de la montagne ce jour-là, mais n’a pas! 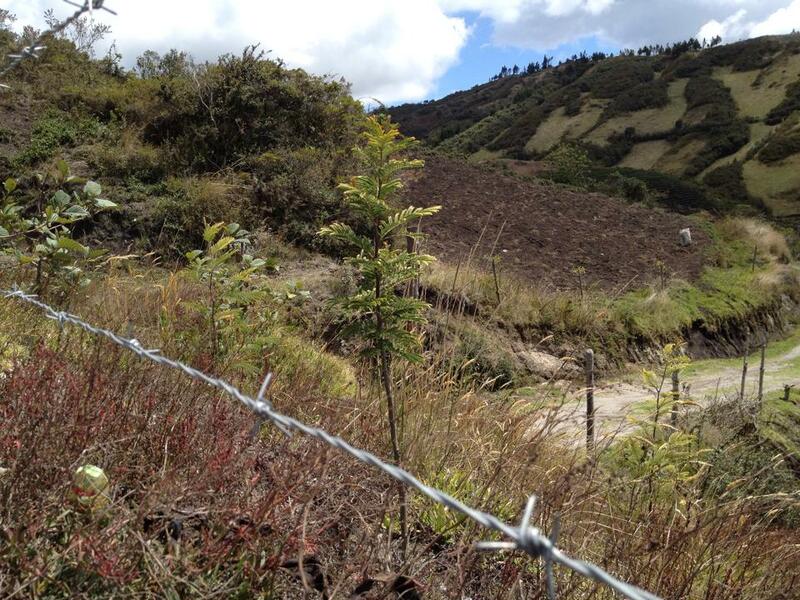 Le quatrième jour, nous sommes allés vers les collines proches de Otavalo nous avons pris les rejets des arbres alder pour Matias de utiliser pour propagation. Steve est devenu le grimpeur de l’échelle pour atteindre le meunier le plus élevé possible et augmenter le nombre de Matias. Le déjeuner était encore un repas fantastique chez Claudia ou nous avons dîné de la nourriture traditionnelle comme l’ajout de pop-corn à notre soupe a la place des biscuits salés comme nous le-ferions aux Etats Unis. Nous avons fini la journée avec un voyage à Cotacachi et les rues remplies de boutiques de cuir et un repas magnifique chez un restaurant local. 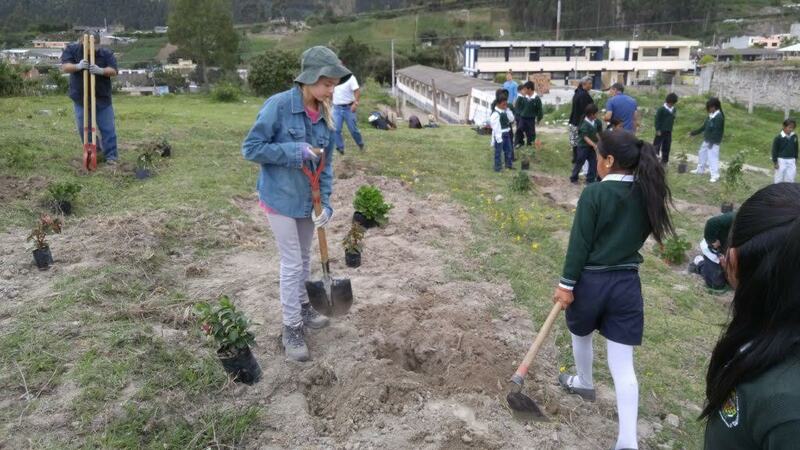 Mardi a commencé activement dans les collines près de Otavalo à Panecillo où nous avons pris des rejets des arbres Alder qu’Anna a planté en 1998 pendant un de ses premiers projets dans la région. Matias a démontré la technique et qualité propre qu’il a désiré et nous étions capable de couper 750 pièces qu’il a mis dans des pots au vivero. Nous avons passé l’après-midi et le soir au village du Cotacachi et de la place des beaux magasins de cuir. Si vous aimez la maroquinerie de qualité (les sacs, les vestes, les chausseurs, etc…) être sûr d’apporter $100 de plus parce que c’est une qualité incroyable mais pas trop cher. Être sûr d’obtenir un peu de café d’emmener chez vous au magasin de Café Intag, juste à côté de la place du village et à visiter la boutique de cadeaux à gauche pour quelques cadeaux fait à la main par des femmes incroyables. Les aventures de mercredi nous a pris par bus à l’école de Guachinguero où quelques d’entre nous ont aidé dans le jardin de l’école et les autres ont travaillé avec trois garçons, qui ont 10-12 ans, à planter le quinoa sur une pente presque verticale près de l’école. En utilisant des binettes traditionnelles, 4 femmes américaines éparpillant des graines, n’étaient pas capables de suivre trois garçons en train de biner le côté de la colline ! Dans le jardin de l’école, des fleurs et des arbustes ont été déplacés, et une haie de lantana a été plantée autour de la limite. La taille des larves dans le sol étonné beaucoup d’entre nous y compris celui qui était plus grande que nos pouces. Après le jardinage et la plantation ont été terminés, les étudiants ont été divisé en trois groupes par classe et mis dans une rotation de trois séances de jardinage différent. Un group a développé un program pour démontrer l’eau disponible du monde en utilisant une pomme, un group a démontré le départ de semences dans la coquille d’un orange mandarine, et le dernier group a démontré comment il est facile de composter. L’enseignante a été tellement impressionné par la leçon de compost qu’elle dit qu’elle va trouver un endroit pour composter à l’école. Le déjeuner était un repas fantastique, composé d’une soupe quinoa fait par une mère de l’école. Sa main louche en bois sculpté fait peur à tous les enfants ! 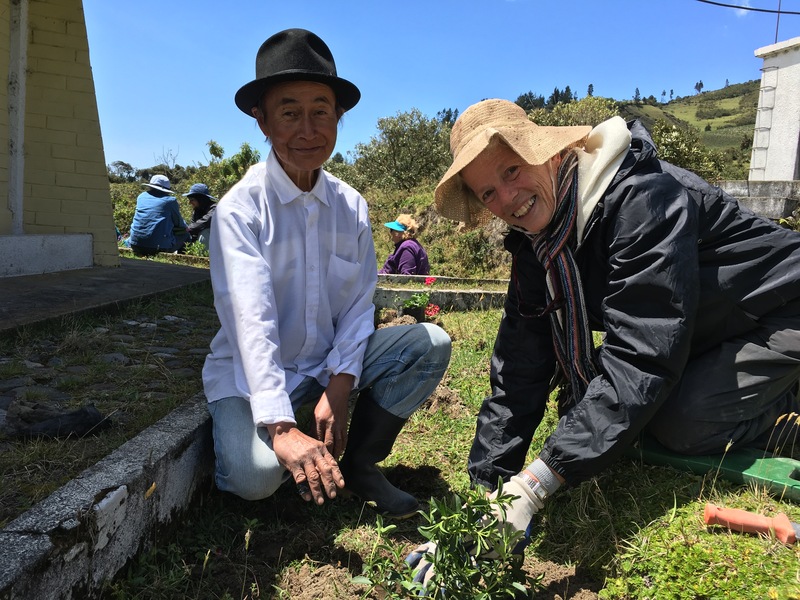 L’après-midi était un tour du site d’Otavalo pour la plantation des roses qui s’appelle La Ferme Falcon. La ferme a 67 hectares des roses tous sous plastique, irrigation plein goutte à goutte, et certifié par l’Alliance de Forêt Tropical pour le utilisation minimal des herbicides et pesticides. Chaque tige de la racine et variété rose grefféproduit des roses pour une moyenne de 17 ans. Chaque hectare peut de la plantation peut produire 2.5 milliard des roses chaque an ! Le directeur de la plantation était fantastique et a changé le nom du paquet de nourriture des roses à Rose Viagra pour toujours. Le directeur nous a gracieusement donné 8 bouquets des roses dont certaines pour bénévole Thea de son mari Steve pour leur 50ème anniversaire de mariage ! Les autres bouquets étaient séparés par les stagiaires et livrés à leurs mamans d’accueil et un des bouquets, composé de fleurs préférées du directeur, était donné à Maggie à son hôtel pour son hospitalité. Jeudi, Matias était content était content d’avoir nous retournons et remplir le parterre de fleurs dedans la serre avec des graines en pots, pendant que d’autres entre nous ont continué à arracher les mauvaises herbesdes arbres en pot à l’extérieur. Nous avons lui présenté avec les nouvelles que le groupe avait rassemblé l’argent à acheter des fenêtres pour son nouveau bâtiment, et Debbie lui a donné un marteau, un scie à main, et un mètre ruban escamotable, qui la laissé sans voix ! Il était reconnaissant qu’il ne devra pas utiliser une pierre pour à marteler les choses ! Nous sommes allés voir les compétences incroyables du Maître Tisserand Miguel. De moutons à tisser, nous avons pu voir le processus en entière. Apportez un peu d’argent supplémentaire pour cette visite aussi parce que ses pièces sont irrésistibles mais les prix varient entre $10-$500.Si vous restez dans la Hôtel de Maggie, elle a beaucoup de ses pièces exposées et à vendre. Nous avons terminé la soirée aven un repas incroyable à PuergoLago et et le don de nos T-shirts officiels de Tandanaavec quelques mots sincères incroyables du personnel. Nous sommes tous touchés par ce qu’ils ont dit à propos de chacun d’entre nouset ne pourrait jamais croire que tant de talent se trouve dans les stagiaires Tandana. Aujourd’hui c’est Vendredi,et nous sommes chargés d’un arrêt à l’équateur réel (pas la location touriste), un déjeuner pique-nique, une visite chez le producteur d’orchidées à Quito et puis dîner que nous commençons tous à se séparer. Ces types des vacances bénévoles ne sont pas pour tout le monde, mais chaque personne qui participe rentre à la maison avec plus que jamais imaginéet se développe d’une manière qu’ils ne devraient. Inscrivez-vous! Vous n’allez jamais le regrettez. by Mo Stenger. Originally published on Mo’s blog, my life in a shoebox. You can see more of her posts here. 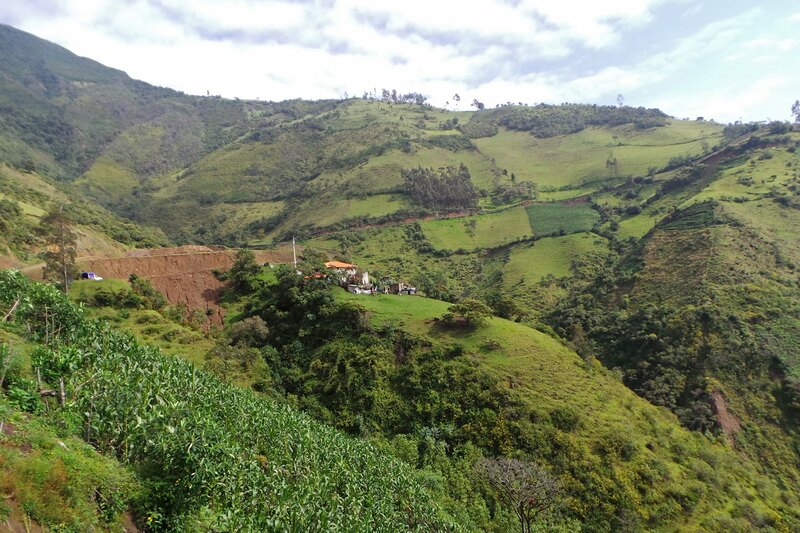 Six months ago during an internet search for school gardens in South America, I came across images of an incredible garden perched on a hillside in the northern Andes in a rural community in Ecuador. 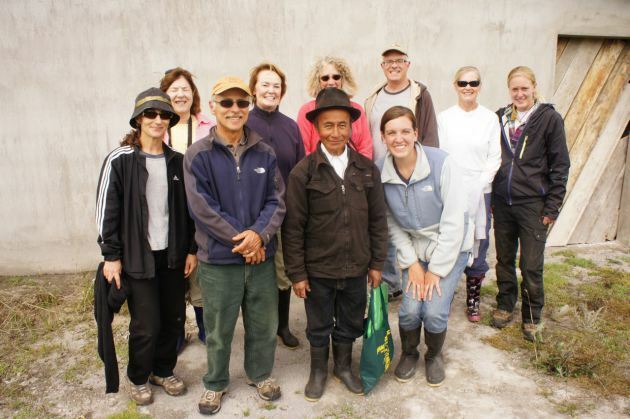 While I was unable to make contact with the school, the search lead me to The Tandana Foundation, a small group that works with communities in Ecuador and Mali. Anna Taft, the ED at Tandana has been gracious and amazing in setting up opportunities for me to get into three local schools. 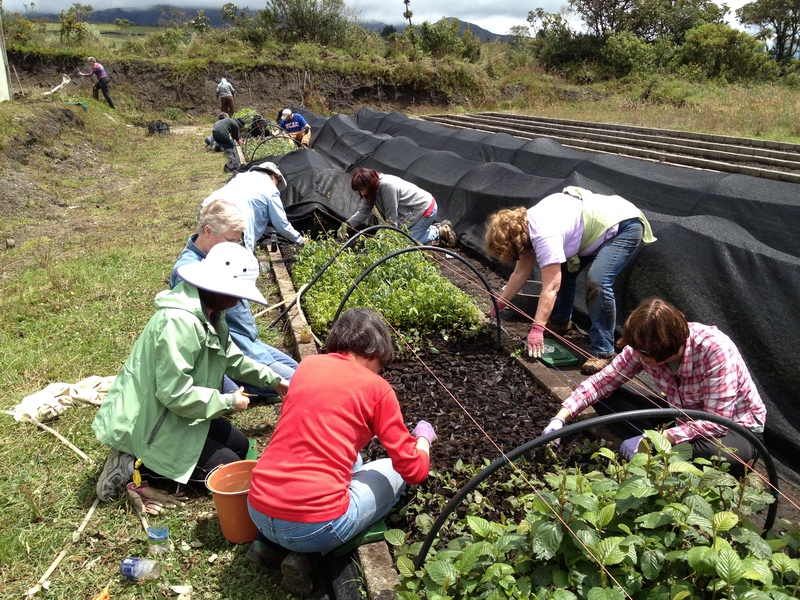 My first week in Ecuador corresponded with a group of master gardeners on a volunteer vacation through Tandana. Fate somehow dropped us all at Quichinche on a Thursday morning in mid-October, a time when planting is at its prime due to the onset of the rains. 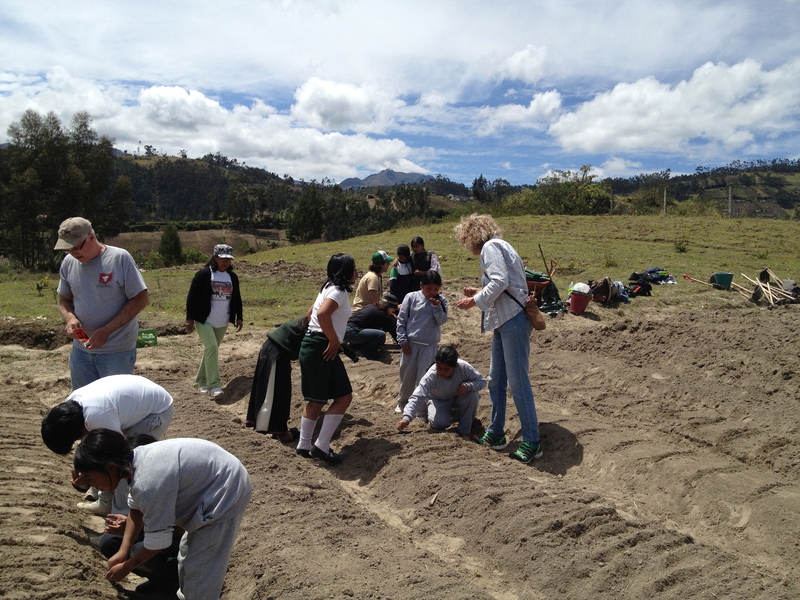 I was immediately awestruck when I walked up the dirt hill that leads to the school garden at Quichinche. The immense plot of land, unprepared other than two beds that had been turned by students in the past week, is set against a backdrop of high mountains whose peaks were obscured by clouds. As I stood gazing at the land and contemplating the project, I knew that everything I have done to get to this point has been right. It was the first time in the past four months that I had the solid feeling that I made the best decision for me at this point in my life…a moment of enlightenment and a sense of peace. 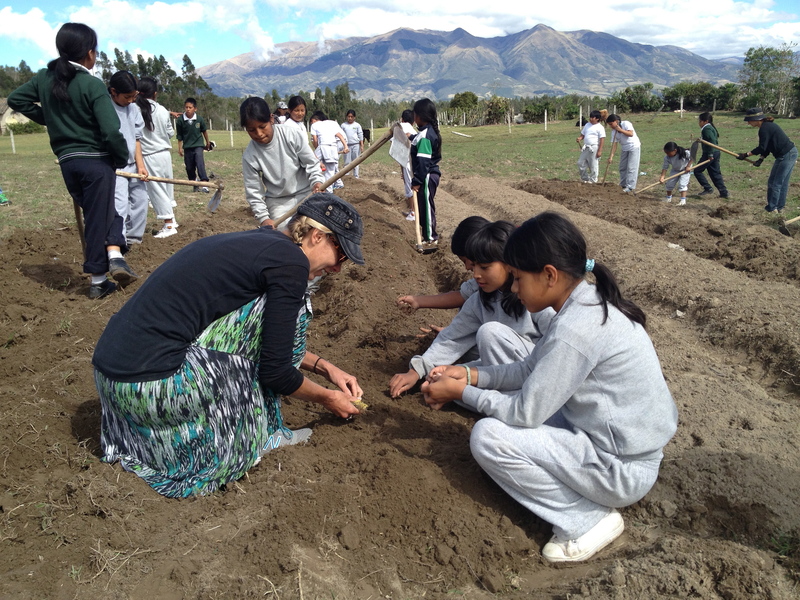 I had the good fortune to join a class of 38 eleven year olds who entered el huerto (garden) with a hefty objective for the day: turn over the land, create four beds (2’ x 100’) and plant a variety of seeds. 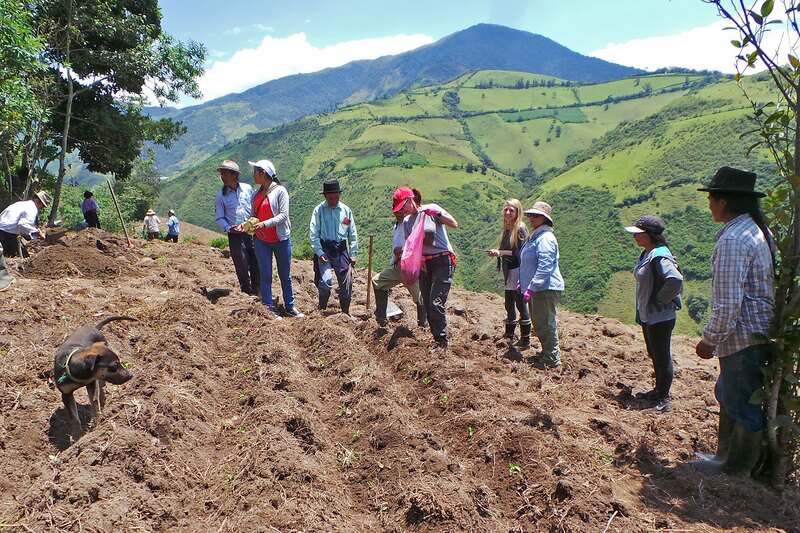 With the enthusiasm of youth and a work ethic beyond their years, the students made quick work of the initial phase: los niños deftly turned the terra with hoes to create rows and beds, while las niñas followed behind and denuded the soil of loose grass and roots. 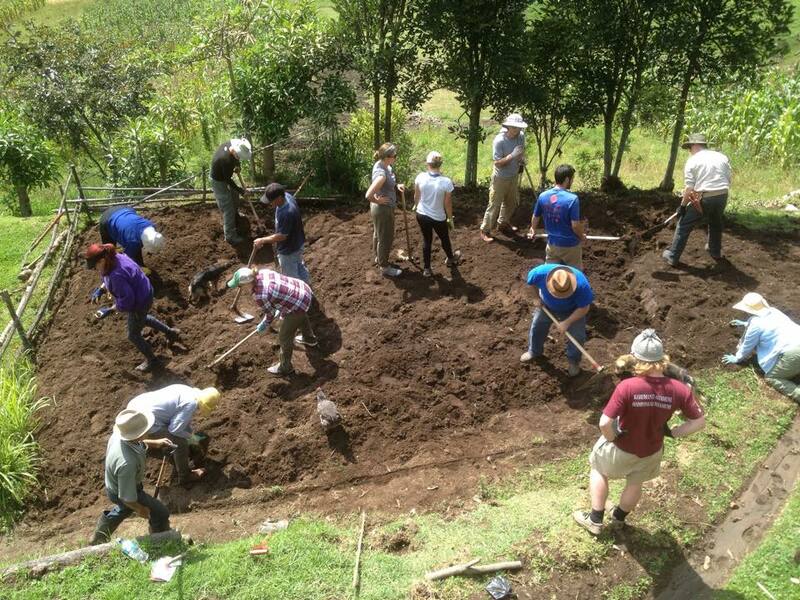 It was an amazing experience to work aside my small group, lightly conversing in my slowly progressing Spanish as we knelt in the dirt stripping the grass. I realized how much I have missed working with students and what a privilege it is to be accepted into their world. 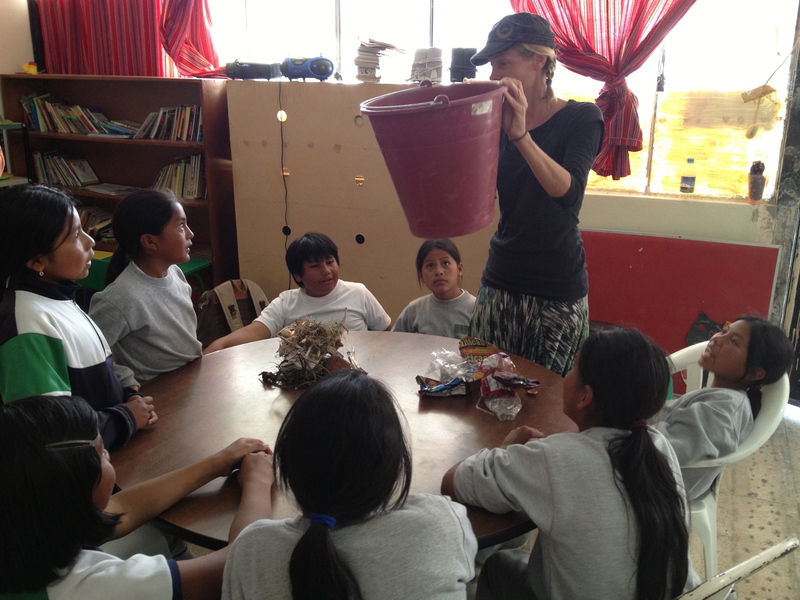 Mo teaches students about compost. 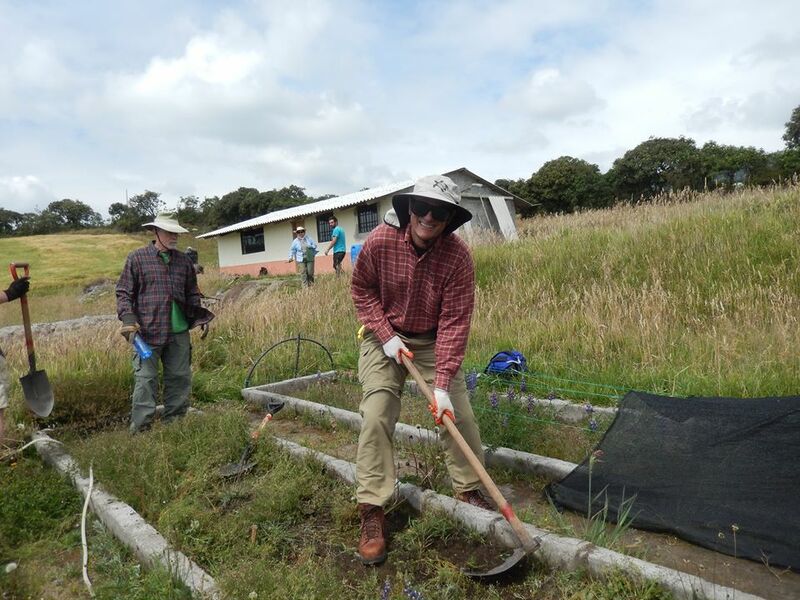 In the end, the overachieving group surpassed the original goal and created a total of eight beds that were prepared for planting. 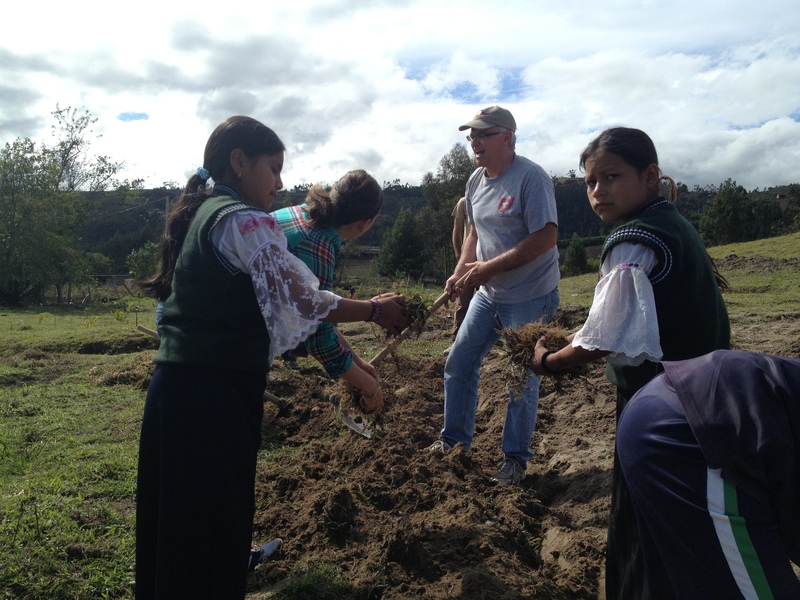 After a brief break and some wrangling to regroup, the class was split among the adults for the planting task. I’ll admit that I let out a whoop of happiness and a jump when I was handed a packet of swiss chard semillas (seeds); I momentarily reverted to being like a child in my excitement. It was another of those little moments when the stars aligned: chard quickly became a favorite during my work with the Stephanie Alexander Kitchen Garden program in Australia…where the seed for this journey was initially planted. I modeled the process of planting and Danika, the volunteer coordinator at Tandana, translated my directions to my group; together we made short work of planting our long row of greens. I eagerly await the opportunity to see the tiny shoots sprouting through the dirt before my visits to Quichinche end in late November. 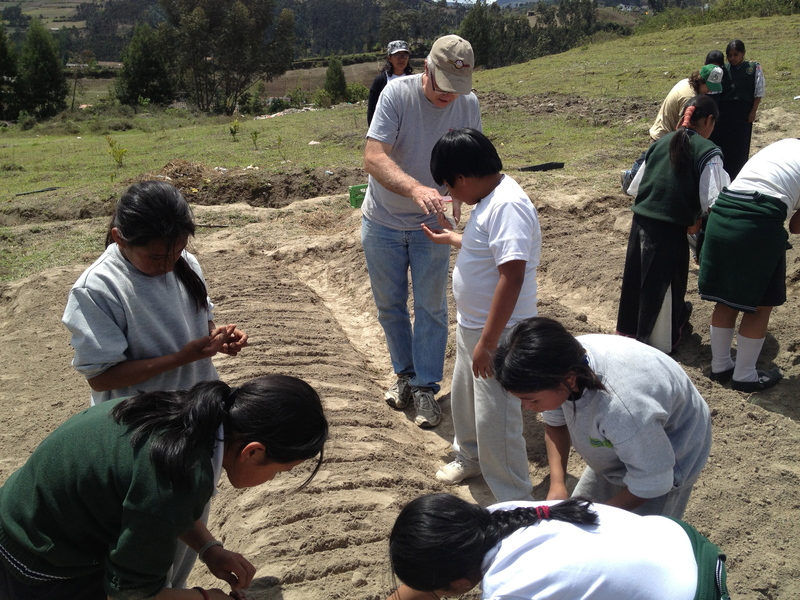 For me, this initial experience at Quichinche went much deeper than the simple acts of digging and planting; it was the spark has that reignited my passion. I can’t adequately express my gratitude to all of children and adults (cerca y lejos) who have linked together to help make my dream become a reality; it is a feeling that is incredibly overwhelming! 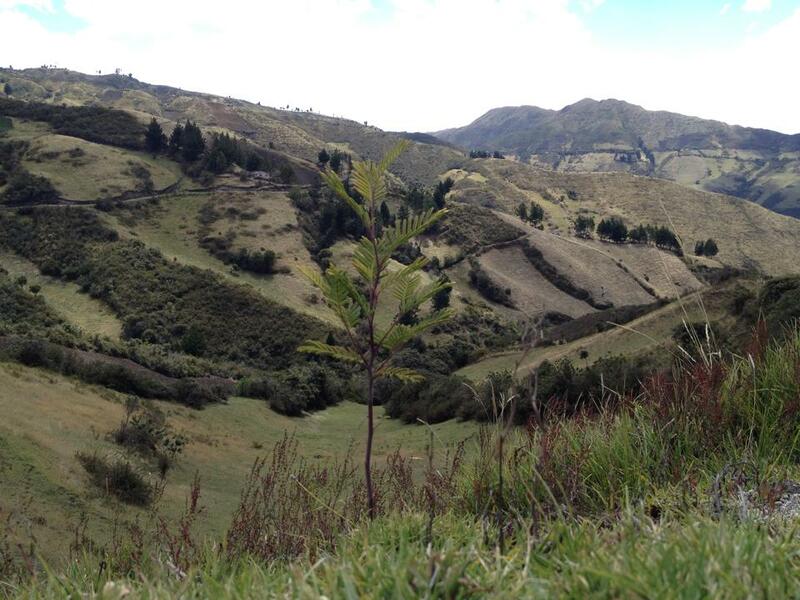 Hace seis meses, durante una búsqueda en Internet para los huertos escolares en América del Sur , me encontré con imágenes de un increíble jardín colgada sobre una colina en el norte de los Andes , en una comunidad rural de Ecuador . Aunque no pude entrar en contacto con la escuela , la búsqueda me llevó a la Fundación Tandana , un pequeño grupo que trabaja con las comunidades de Ecuador y Malí. Anna Taft , la Directora de Tandana ha sido muy bueno y exelente en la creación de oportunidades para que yo trabaje en tres escuelas locales . 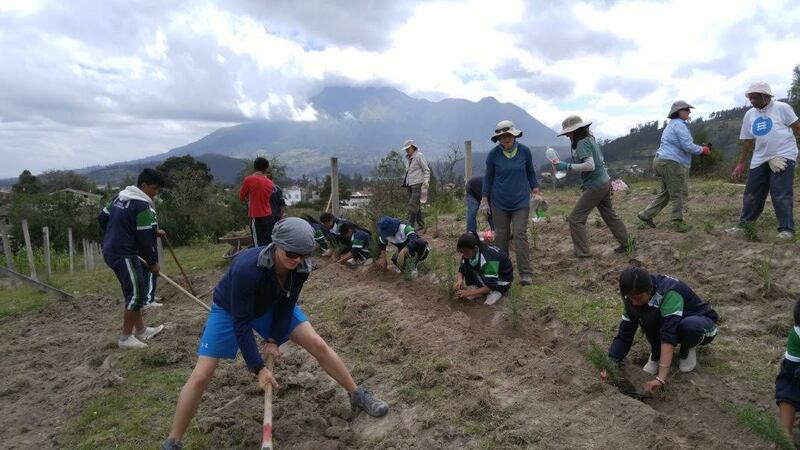 Mi primera semana en Ecuador se correspondía con un grupo de maestros jardineros en una vacación de voluntariado a través Tandana . El destino de alguna manera nos llevó todos a Quichinche en un jueves por la mañana a mediados de octubre , época en que la plantación está en su mejor momento debido a la llegada de las lluvias . Yo estaba encantada de inmediato cuando caminaba por la colina de tierra que conduce al jardín de la escuela en Quichinche . El inmenso terreno , no preparado menos dos camas que habían sido construidos por los estudiantes durante la semana pasada , se sitúa en un contexto de altas montañas cuyos cumbres se ocultan por las nubes . Mientras estaba mirando el terreno y contemplando el proyecto , sabía que todo lo que he hecho para llegar a este punto ha sido correcto. Fue la primera vez en los últimos cuatro meses que tuve la sensación sólida de que tomé la mejor decisión para mí en este momento de mi vida … un momento de iluminación y una sensación de paz . Tuve la suerte de unirme a una clase de 38 niños de once años que entraron en el huerto (jardín) con un objetivo fuerte para el día : la vuelta a la tierra, la creación de cuatro camas ( 2 ‘ x 100’) y la sembrada de una variedad de semillas . Con el entusiasmo de la juventud y una ética de trabajo más allá de sus años , los estudiantes hicieron un trabajo rápido de la fase inicial : los Niños hábilmente convirtieron la tierra con azadas para crear filas y camas , mientras que Las Niñas siguieron atrás y despojaban del suelo la hierba suelta y raíces . Fue una experiencia increíble trabajar al lado de mi grupo pequeño , ligeramente hablando en mi español que esta progresando lentamente cuando nos arrodillamos en la tierra a pelar la hierba. Me di cuenta de lo mucho que he extrañado trabajar con los estudiantes y qué privilegio es ser aceptado en su mundo. Al final, el grupo trabajador superó la meta original y creó un total de ocho camas que fueron preparados para la siembra. Después de un breve descanso y algunas discusiones para reagruparse , la clase se dividió entre los diferentes adultos para la tarea de la siembra. Admito que yo dejé escapar un grito de alegría y un salto cuando me entregaron un paquete de semillas de acelga suiza (semillas ), y que momentáneamente volví a ser como una niña en mi emoción . Era otro de esos pequeños momentos en los que las estrellas se alinearon : acelga rápidamente se convirtió en uno de los favoritos durante mi trabajo con el programa Jardín Cocina Alexander Stephanie en Australia … donde la semilla para este viaje fue plantado inicialmente . Modelé el proceso de siembra y Danika , el coordinador de voluntarios en Tandana , traducia mis instrucciones a mi grupo , que en conjunto nos hizo breve el trabajo de plantar nuestra larga fila de las verduras. Espero con impaciencia la oportunidad de ver los pequeños brotes que brotan a través de la tierra delante de mis visitas a Quichinche a finales de noviembre . Para mí , esta experiencia inicial en Quichinche iba mucho más allá de los simples actos de cavar y plantar , sino que fue la chispa que ha vuelto a encender mi pasión. No puedo expresar adecuadamente mi gratitud a todos los niños y adultos ( Cerca y Lejos ) que han unidos para ayudar a que mi sueño se haga realidad , es una sensación de que es increíblemente abrumador! Il ya six mois lors d’une recherche sur Internet pour les jardins scolaires en Amérique du Sud , je suis tombé sur des images d’une incroyable jardin perché sur une colline, dans le nord des Andes dans une communauté rurale en Équateur. Bien que je n’ai pas réussi à entrer en contact avec l’école , la recherche m’a conduit à la Fondation Tandana , un petit groupe qui travaille avec les communautés en Equateur et au Mali. Anna Taft, la directrice à Tandana a été aimable et étonnante dans la mise en place des occasions pour moi d’entrer dans trois écoles locales. Ma première semaine en Equateur correspondait à un groupe de maîtres jardiniers en vacances de bénévoles à travers Tandana . Le destin en quelque sorte tombé à nous tous Quichinche le jeudi matin à la mi- Octobre , un moment où la plantation est à son apogée en raison de l’ arrivée des pluies . J’étais émerveillé immédiatement quand je suis entré sur la colline de terre qui mène au jardin de l’école à Quichinche . L’immense terrain , dépourvu autre de deux lits qui avait été transformée par les étudiants la semaine dernière , est placé sur un fond de hautes montagnes dont les sommets ont été obscurci par les nuages. Comme je me tenais en regardant la terre et en contemplant le projet , je savais que tout ce que j’ai fait pour arriver à ce point a ete correct. C’était la première fois au cours des quatre derniers mois que j’ai eu le sentiment solide que j’ai pris la meilleure décision pour moi à ce stade de ma vie … un moment d’illumination et un sentiment de paix . J’ai eu la chance de participer avec une classe de 38 eleves d’onze ans qui sont entrés au huerto ( jardin) avec un objectif très lourd pour la journée : retourner la terre, la création de quatre lits ( 2 ‘ x 100′) et planter une variété de graines . Avec l’ enthousiasme de la jeunesse et une éthique de travail au-delà de leurs années , les élèves ont fait le travail rapide de la phase initiale : los niños habilement ont tourné la terre à la houe pour créer des lignes et des lits , tandis que las niñas suivait et dénudé le sol de l’herbe et les racines . Ce fut une expérience incroyable de travailler a côté de mon petit groupe , conversant légèrement dans mon espagnol, qui progresse lentement, comme nous nous sommes agenouillés dans la poussière dépouillant l’herbe. J’ai réalisé combien ca m’a manqué de travailler avec les élèves et quel privilège c’est d’être acceptés dans leur monde . Au final, le groupe surperperformante a dépassé l’objectif initial et a créé un total de huit lits qui ont été préparés pour la plantation. Après une brève pause et quelques empoignades de se regrouper, la classe a été divisée entre les adultes pour la tâche de la plantation. Je vais vous avouer que je poussai un cri de bonheur et un saut quand on m’a remis un paquet de semilles de bettes (semences ) ; je suis momentanément redevenu comme une enfante dans mon entousiasme . C’était un de ces petits moments où les étoiles sont alignées : La bette est rapidement devenu un favori dans mon travail avec le programme de Kitchen Garden Alexander Stephanie en Australie … où la semence de ce voyage a été initialement planté . 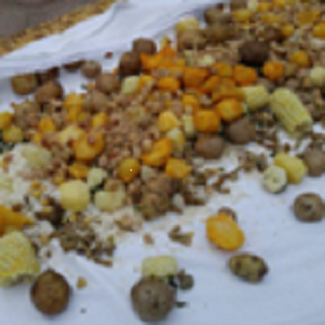 J’ai modélisé le processus de plantation et Danika , la coordonnatrice des bénévoles au Tandana , a traduit mes instructions à mon groupe , ensemble, nous avons fait qu’une bouchée de la plantation de notre longue rangée de légumes verts. J’attends avec impatience l’occasion de voir les petites pousses germées dans la poussière devant mes visites à Quichinche à la fin Novembre . Pour moi , cette première expérience à Quichinche est allé beaucoup plus loin que les simples actes de creuser et planter , il a été l’étincelle qui a ravivé ma passion. Je ne peux pas exprimer convenablement ma gratitude à tous les enfants et les adultes ( de pres et de loin ) qui ont lié ensemble pour aider à faire que mon rêve devienne une réalité , c’est un sentiment qui est incroyablement irrésistible ! 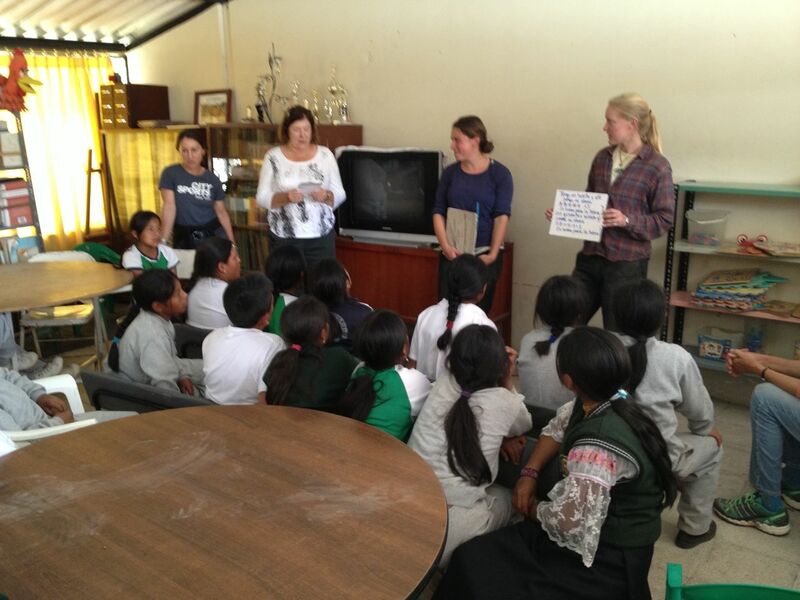 I have always loved the adventure of travel, and I have always appreciated an opportunity to give back. 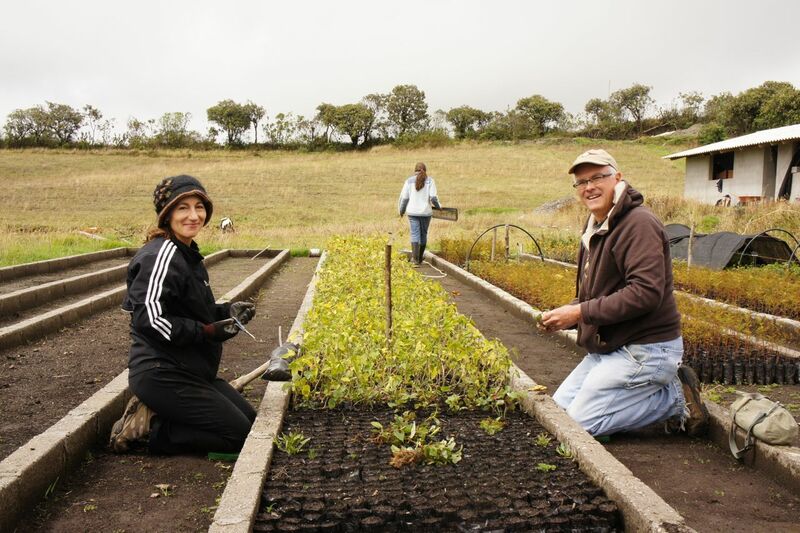 So, at the end of last August, coming across a posting for Tandana Foundation’s volunteer gardening program in Ecuador, I decided to jump at the unexpected chance to escape the rut of my work-a-day world and to do something that really seemed worthwhile. 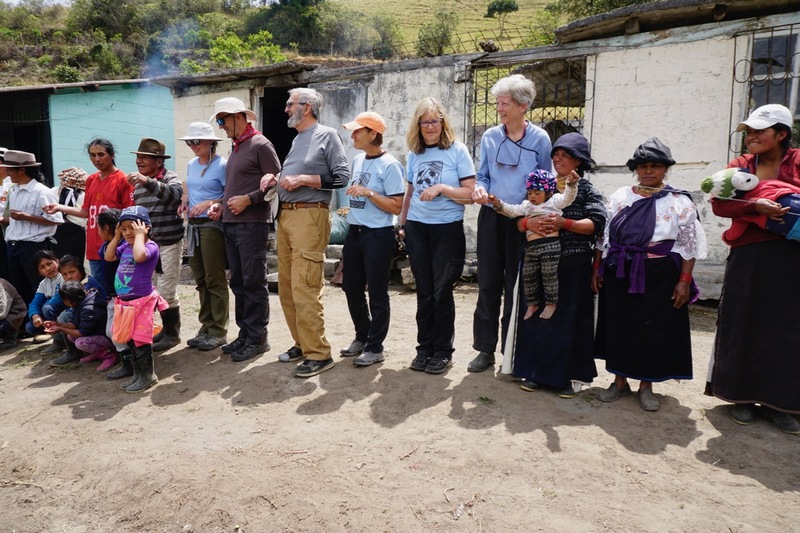 Adventure, meeting new people, sharing new experiences, participating in a new community, all of these things I am looking forward to when I arrive in Otavalo, Ecuador. On our first day at the lovely La Posada del Quinde (“resting place of the hummingbirds”) owned and managed by the very capable Maggie Reniers, we have a group meeting. By way of making introductions, we are asked to name a plant that we most identify with and then to explain why we resemble that plant. Yikes! How slow can a week go by? In fact, a week can go by very fast when you have the good fortune to meet a group of travel companions from Ohio (of all places) as well as the 5 program coordinator/volunteers from Tandana Foundation, all of whom could not have been more welcoming, fun, supportive, knowledgeable and committed wholeheartedly to the work they were doing. Also (and I guess, obviously) there is no sitting around on “volunteer” vacations. 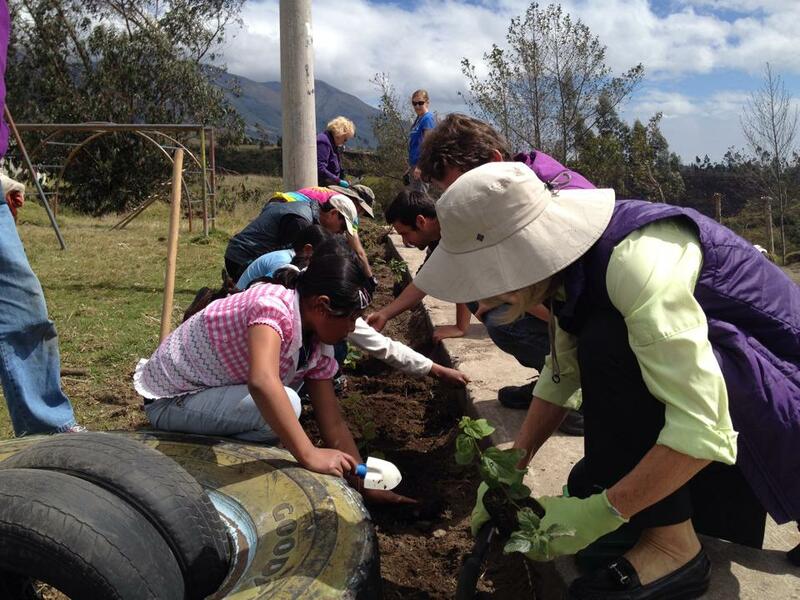 We get started right away on much needed projects for a very special tree nursery. The tree nursery, with the support of the surrounding communities and Tandana Foundation, serves as a place to grow, nurture and supply native trees to nearby families and farmers, as well as to sponsor a number of tree planting projects that stem the tide of deforestation and severe erosion (an unfortunate bi-product of so much land clearing for agriculture and housing).I would be remiss if I failed to mention the always spectacular views of the surrounding mountains and volcanoes, and the many friendly and hardworking members of the local communities, who were enthusiastic for our assistance with projects that are clearly very important to them, their villages and the quality of their environment. All of this and more is included in the price of the tour. where we learn and prepare for a feast of traditional Ecuadorian food such as llapingachos (delicious potato pancakes), curtido de tomate y cebolla (tomato and onion salad with cilantro), quimbolitos (a desert of a type of sweetened corn cake steamed in banana leaves) and fresh mora (blackberry) juice. 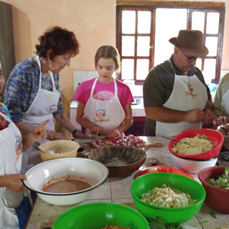 Claudia Fuerez and members of her extended family oversee a very friendly kitchen and beautiful gardens of native fruits, vegetables, and medicinal herbs that support the mission of the school. We also go to visit a sanctuary that rescues and rehabilitates birds of prey (many endangered)and where flight demonstrations for visitors serve the dual purposes of regular exercise for the birds as well as expanding public awareness of their critical ecological importance. It is quite a moving experience to observe these birds as they soar up into the sky, and a lot of fun because the handlers give visitors an opportunity to have a bird come and perch on their arm. I would not describe myself as much of a “birder”, but I was very excited to be in close proximity to such birds as the American Bald Eagle, the Andean Condor, all types of owls and many, many other wonderful avesrapaces. At the end of the week, we participated in a project for a local elementary school with a team of fifth grade students, building and planting a vegetable garden for their school. (including the unforgettable “A-B-O-N-O, A-B-O-N-O, A-B-O-N-O, esbuenapara la tierra…”). Thank for the opportunity to make a contribution and for the wonderful experience of Ecuador. Siempre me ha gustado la aventura de viajar, y siempre he apreciado la oportunidad de dar la espalda. 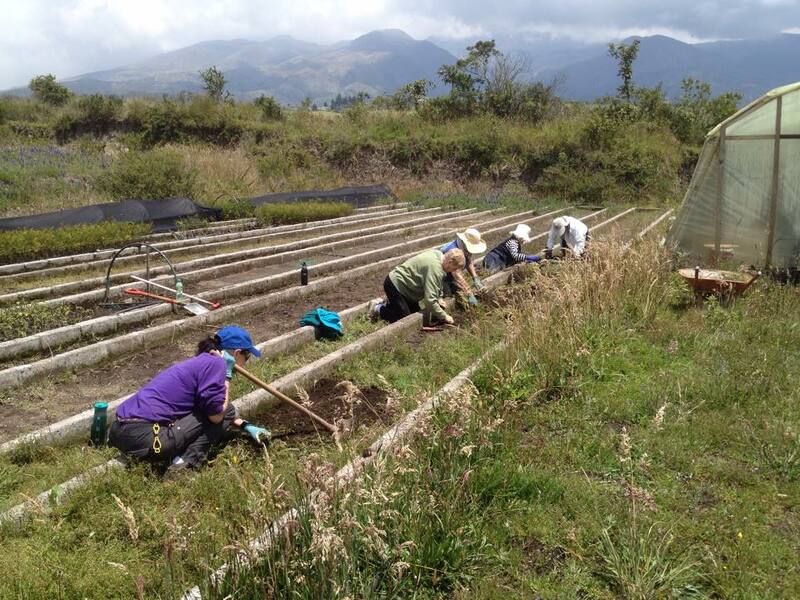 Así , a finales de agosto pasado , al encontrarme con un anuncio para el programa de jardinería voluntario de la Fundación Tandana en Ecuador , decidí pasar la oportunidad inesperada para escapar de la rutina de mi mundo de trabajo diario y hacer algo que realmente parecía que vale la pena . Aventura , conocer gente nueva , compartir nuevas experiencias , participar en una nueva comunidad , todas estas cosas que estoy deseando al llegar a Otavalo , Ecuador . En nuestro primer día en el precioso ambiente de La Posada del Quinde (” lugar de descanso de los colibríes ” ) que pertenece y es administrado por la muy capaz MaggieReniers, tenemos una reunión de grupo. A modo de hacer las presentaciones, se nos pide que nombre a una planta con lacual nos identificamos más y luego explicar por qué nos parecemos a esa planta. ¡Ay ! Qué lento puede pasar una semana ? De hecho , una semana puede pasar muy rápido cuando se tiene la suerte de conocer a un grupo de compañeros de viaje de Ohio ( de todos los lugares ), así como los 5 coordinadores del programa 5 y voluntarios de la Fundación Tandana , todos los cuales no podrían haber sido más acogedor , divertido , solidario , eficiente y comprometido de todo corazón con el trabajo que estaban haciendo. También ( y supongo que , obviamente) no hay momentos vacios en las vacaciones “voluntarios” . Hemos de empezar de inmediato en proyectos muy necesarios para un vivero de árboles muy especial . El vivero de árboles , con el apoyo de las comunidades aledañas y la Fundación Tandana , sirve como un lugar para crecer , cultivar y suministrar árboles nativos a las familias y los agricultores cercanos , así como para patrocinar una serie de proyectos de plantación de árboles que se derivan de la marea de la deforestación y la erosión severa ( un subproducto desafortunado de tanto el desmonte para la agricultura y la vivienda ) . Sería negligente si no mencionara las vistas, siempre espectaculares, de las montañas y volcanes, y los muchos miembros amigables y trabajadoras de las comunidades locales , que estaban entusiasmados por nuestra asistencia a los proyectos que son claramente muy importante para ellos , sus pueblos y la calidad de su medio ambiente. Todo esto y mucho más está incluido en el precio de la excursión . Además de la programación de proyectos de voluntariado , el itinerario también ofrece una variedad de diferentes e interesantes visitas turísticas y actividades , incluyendo visitas a los alrededores de la belleza natural, un amplio recorrido por una plantación de rosas ( Ecuador suministra aproximadamente el 37 % del mercado mundial para las rosas ) , una celebración de la cocina nativa a una escuela de cocina local, donde aprendemos y nos preparamos para una fiesta de comida tradicional ecuatoriana como llapingachos ( deliciosas tortitas de papa ) , curtido de tomate y cebolla ( tomate y ensalada de cebolla con cilantro) , quimbolitos ( un postre de un tipo de torta de maíz dulce cocido al vapor en hojas de plátano ) y jugo de mora fresca (mora ) . Claudia Fuerez y los miembros de su extensa familia supervisan una cocina muy agradable y hermosos jardines de frutas nativas , vegetales y hierbas medicinales que apoyan a la misión de la escuela. También vamos a visitar un santuario que rescata y rehabilita a las aves de rapiña ( muchas en peligro de extinción ) y en demostraciones de vuelo para los visitantes sirven el doble propósito del ejercicio regular para las aves , así como la ampliación de la conciencia pública sobre su importancia ecológica fundamental. Es toda una experiencia conmovedora para observar estas aves , ya que se elevan hacia el cielo , y también un montón de diversión , porque los controladores dan a los visitantes la oportunidad de tener un pájaro vienen y anidan en sus brazos. Yo no me describiría como mucho de un ” observador de aves ” , pero yo estaba muy emocionada de estar en estrecha proximidad a aves como el águila calva americana, el Cóndor de los Andes , todos los tipos de búhos y muchas, muchas otras maravillosas aves rapaces . Al final de la semana , hemos participado en un proyecto para una escuela primaria local con un grupo de estudiantes de quinto grado , construit y plantar un huerto para su escuela. Esto es sin duda un proceso de caos ” administrada” , pero , he aquí, al final de la mañana, lo que surgió del polvo ( en medio de vacas errantes , gallinas y el perro de la casa de Danika ) fue un conjunto completo de camas elevadas y amplio surtido de vegetales plantados y listo para crecer . Después de nuestro éxito en el jardín, que daba clases en los temas de entomología y abono natural (incluyendo el inolvidable ” ABONO , ABONO , ABONO , es buena párr la tierra … “) . 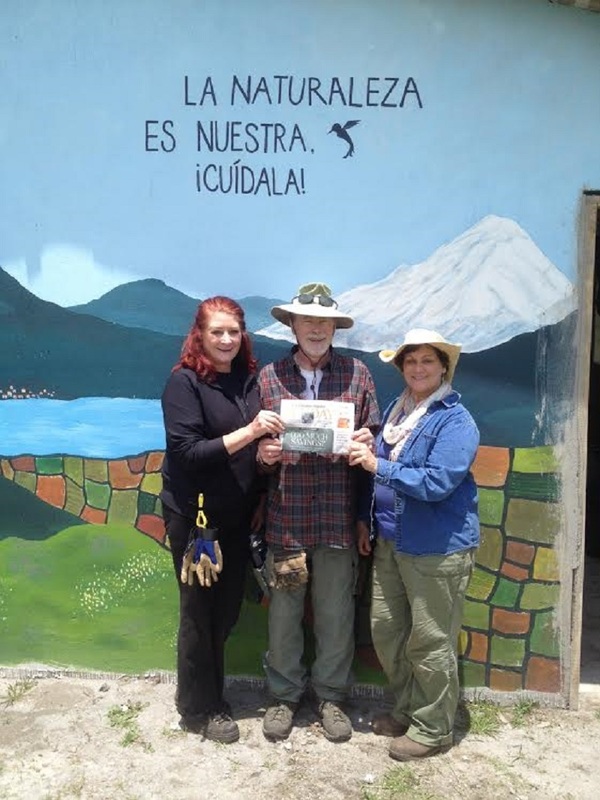 Gracias por la oportunidad de hacer una contribución y por la maravillosa experiencia de Ecuador . Buen viaje y feliz Viaje ! J’ai toujours aimé l’aventure de voyage, et j’ai toujours apprécié la possibilité de donner en retour. Ainsi, à la fin de Août dernier , à venir à travers un affichage pour le programme de jardinage bénévole de Tandana Fondation en Equateur , j’ai décidé de sauter sur l’ occasion inespérée d’échapper à l’ornière de mon monde de travail quotidien et de faire quelque chose qui semblait vraiment valoir la peine . 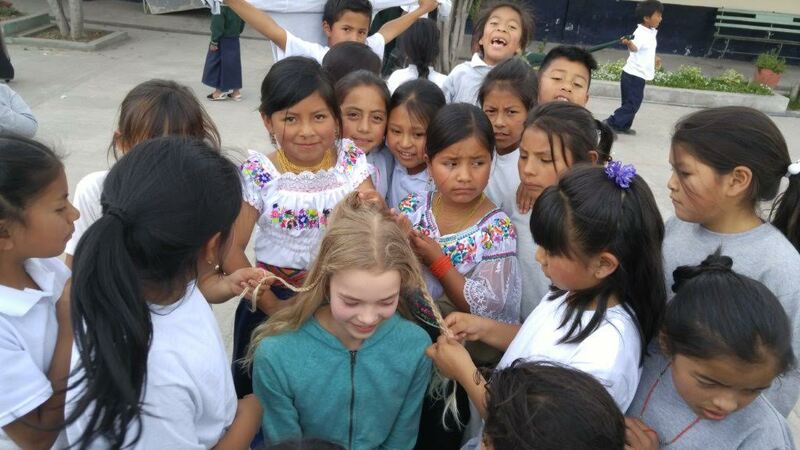 Aventure , rencontrer de nouvelles personnes , partager de nouvelles expériences , participer à une nouvelle communauté , toutes ces choses sont ce que j’attend quand j’arrive à Otavalo , Équateur. Lors de notre première journée à la belle La Posada delQuinde( ” lieu de repos des oiseaux-mouches ») détenue et gérée par la tres capables Maggie Reniers , nous avons une réunion de groupe. En guise de faire les présentations , nous sommes invités à nommer une plante avec laquelles nous identifions plus et ensuite d’expliquer pourquoi nous ressemblons à cette plante. Aïe ! La lenteur d’une semaine peut s’écouler ? En fait, une semaine peut passer très vite quand vous avez la chance de rencontrer un groupe de compagnons de voyage de l’Ohio ( de tous les lieux ) ainsi que les 5 coordinateurs du programme / bénévoles de la Fondation Tandana , dont tous ne pouvaient pas avoir été plus accueillant , amusant , solidaire, compétent et engagé de tout cœur pour le travail qu’ils faisaient. En outre (et je suppose, évidemment) il n’y a pas de moments assis autour des vacances «volontaires» . Nous commencions tout de suite sur des projets bien nécessaires pour une pépinière très spécial. La pépinière , avec le soutien des villages environnantes et la Fondation Tandana , sert de lieu de croître , de nourrir et de fournir des arbres indigènes pour les familles et les agriculteurs voisins, ainsi que de parrainer un certain nombre de projets de plantation d’arbres qui endiguent la déforestation et l’érosion sévère ( un sous-produit malheureux de défrichement tant pour l’agriculture et le logement) . Je serais négligent si je ne mentionnais pas le point de vue toujours spectaculaires sur les montagnes et les volcans environnants, ainsi que les nombreux membres sympathique et travailleur des communautés locales , qui étaient enthousiastes de notre aide avec des projets qui sont clairement très important pour eux , leurs villages et la qualité de leur environnement . Tout cela et plus est inclus dans le prix du voyage . En plus du calendrier des projets de bénévolat , notre itinéraire a également offert une variété de différent et des attraits touristiques intéressants activités , y compris les visites dans les zones proches de la beauté naturelle , une visite complète d’une plantation de roses (Equateur fournit environ 37% du marché mondial pour les roses ) , une célébration de la cuisine indigène dans une école de cuisine locale , où nous apprenons et nous préparons pour un festin de mets traditionnel équatorien comme llapingachos ( délicieuses crêpes de pommes de terre ) , curtido de tomate y cebolla ( salade de tomates et d’oignons avec coriandre) , quimbolitos ( un désert d’un type de gâteau de maïs sucré cuit à la vapeur dans des feuilles de bananier ) et Mora ( mûre) jus de fruits frais . Claudia Fuerez et les membres de sa famille élargie supervisent une cuisine très chaleureux et les superbes jardins de fruits indigènes , les légumes et les herbes médicinales qui appuient la mission de l’école. Nous allons aussi visiter un sanctuaire qui sauve et réhabilite les oiseaux de proie ( dont nombre sont menacées ) et où des démonstrations en vol pour les visiteurs servent les deux fins de l’exercice régulier pour les oiseaux ainsi que de sensibiliser davantage le public à leur importance écologique critique. C’est une expérience très émouvante pour observer ces oiseaux car ils s’élancent dans le ciel, et aussi beaucoup de plaisir parce que les gestionnaires donnent aux visiteurs l’occasion d’avoir un oiseau viennents’asseoir sur leur bras. Je ne voudrais pas me décrire autant d’un ” ornithologue ” , mais je suis très heureux d’ être à proximité de ces oiseaux que l’American Bald Eagle , le condor des Andes , tous les types de hiboux et beaucoup, beaucoup d’autres magnifiques aves rapaces . A la fin de la semaine, nous avons participé à un projet pour une école élémentaire locale avec une équipe d’étudiants de cinquième année , la construction et la plantation d’un jardin potager pour leur école . Ce fut certainement un processus de chaos ” géré ” , mais voici, à la fin de la matinée, ce qui est né de la poussière ( au milieu des vaches errantes , des poules et le chien de la maison de Danika ) est un ensemble complet de lits surélevés et un large assortiment de légumes plantés et prêt à grandir . Suite à notre succès dans le jardin , nous avons donné des cours sur les sujets de l’entomologie et le compostage (y compris l’inoubliable ” ABONO , ABONO , ABONO , es buena para la tierra …»). Merci d’avoir l’occasion d’apporter une contribution et pour la merveilleuse expérience de l’Équateur. 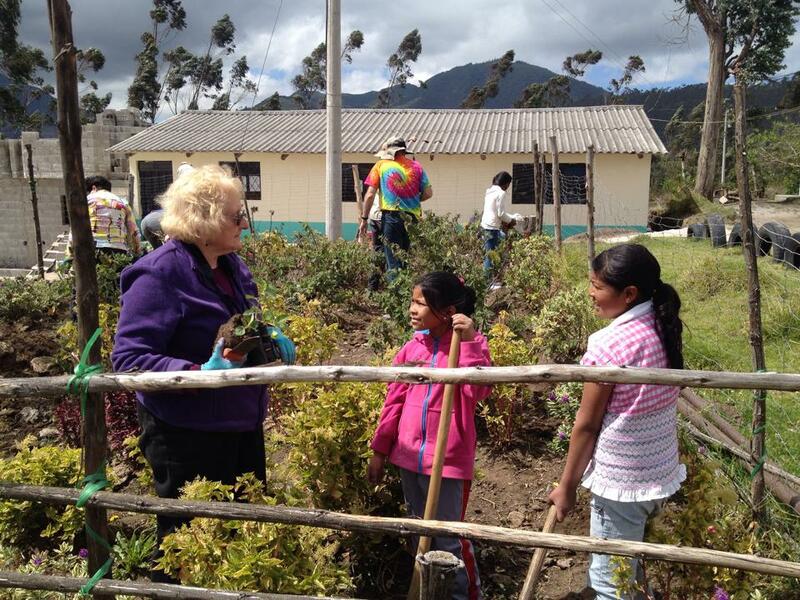 Hola amigos y amigas, soy Cristina Fuerez de Otavalo – Ecuador quiero compartir una experiencia muy linda que viví con ustedes jardineras voluntarias en el mes de febrero del 2013. Muy temprano una mañana de lluvia salimos con mi hermana Margarita desde la comunidad de Panecillo hacia la comunidad de Achupallas, para trabajar ahí con las plantas junto a señoras extranjeras. En el recorrido del camino nos encontramos con muchas señoras extranjeras y saludamos con mucha alegría tuvimos la oportunidad de conversar muchas cosas: como mi cultura, costumbres y tradiciones. Después de muchas platicas muy interesantes llegamos a nuestro destino Comunidad de Achupallas era un lugar muy maravilloso llena de armonía y paz y un poco más frio que mi comunidad. Al instante cogimos nuestras herramientas para trabajar en el vivero de plantas nativas de ese lugar con la ayuda del Señor Matías, como instructor que sabe mucho de las plantas nos enseñó cómo debemos sacar a las plantas sin que sus raíces y sus tallos se arranquen, hacer el almacenamiento para que luego sea transportado al otro sitio para que siga creciendo más, después de esto ya será listo para sembrar en montañas al borde de las quebradas o como también se puede sembrar en las casas para adorno. Entonces todas trabajamos como hormiguitas haciendo cadena para transportar a las plantas, todas las extranjeras estaban muy felices, al trabajar así, y algunas de las plantas sembramos al borde de una quebrada para romper los vientos, es así como debemos cuidar a nuestra naturaleza y también quiero decir a las jardineras, gracias por preocuparse. Y cuando llego la hora del almuerzo comimos empanadas muy ricas con ensalada fría de quinua con pan y queso, chocolates, galletas, gaseosas y agua. Eso era nuestra actividad hasta el mediodía, después de esto nos trasladamos a la Laguna de Cuicocha, en este lugar yo fui la guía para el grupo de voluntarios y explique sobre la formación de esta laguna, su historia y algunos cuentos. Como por ejemplo el CHUZA LONGO de la Laguna (cuento), también explique los nombres de las plantas silvestres y su uso. Bueno la lluvia nos acompañó pues era muy lindo mirar la Laguna, llena de nubes y muchas gotas de agua que hasta nosotros tuvimos que mojarnos y estábamos con mucho frio, seguro que les gusto mi charla, la laguna con sus paisajes muy hermoso, todas las extranjeras estaban muy contentas y todas regresamos a la casa. Eso era todo por este día. Después de unos días, otra vez tuve la oportunidad de ser guía para el mismo grupo de jardineras en la casa de Claudia Fuerez, para la exposición de plantas medicinales, ornamentales, árboles frutales y hortalizas, pues estaban muy contentos, alegres y emocionados al poder conocer muchas plantas. Al finalizar esto, de pronto demostré mi trabajo artesanal de bordados y confecciones de bolsas y blusas vestimenta de Otavalo, servilletas y manteles que les encanto muchísimo. Algunas de ellas me compraron para ponerse ellas. Soy innovadora en bordados desde muy pequeña porque esto es mi sueño desde pequeña de poder bordar muchas cosas muy lindas, pues nunca tuve una instructora para aprender, pero con mi propio esfuerzo, mucha dedicación e imaginación aprendí a realizar trabajos excelentes pero nunca pensé que a ustedes les interesara mis artesanías por eso en esta oportunidad quiero decir muchas gracias por el aprecio y por el apoyo de mi talento. Gracias Anita Taft y la fundación TANDANA, los agradezco mucho, a los grupos de jardineras, los médicos voluntarios, los ayudantes y estudiantes voluntarios. 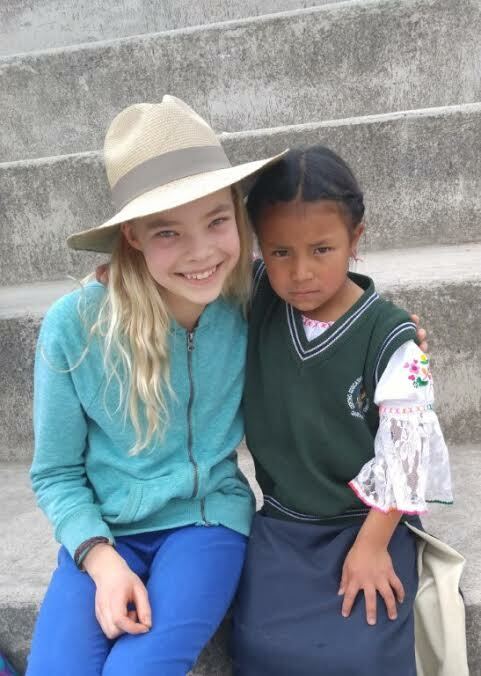 Gracias por su visita y sus actividades en mi lindo país Ecuador esto es muy importante para nosotros, espero que regresen muy pronto. Recuerden que Ecuador es un país maravilloso, tú puedes encontrar muchos lugares mágicos y en gastronomía muchas comidas muy deliciosas. También tienes la oportunidad de compartir con gentes amables e innovadoras. 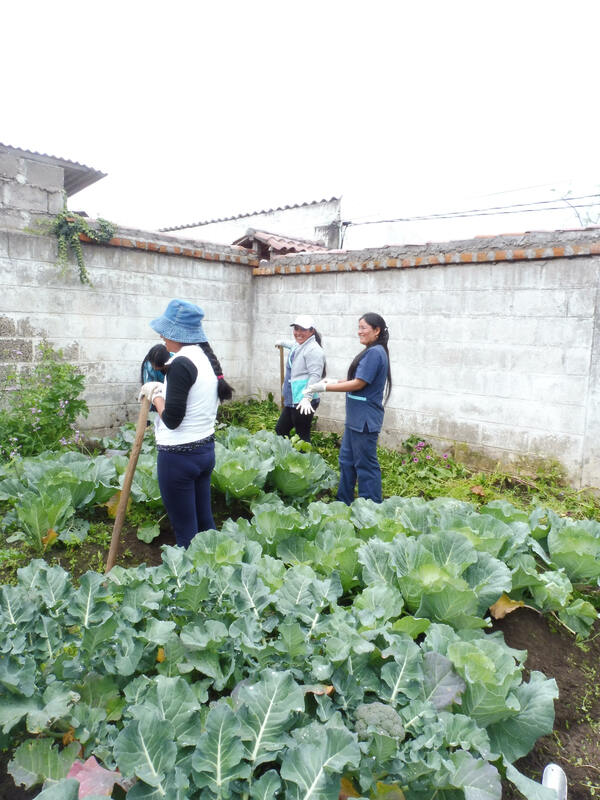 Hello friends, I’m Cristina Fuerez from Otavalo – Ecuador and I want to share a very nice experience I had with you volunteer gardeners in the month of February 2013. Very early one rainy morning we went with my sister Margaret from our community to the community of Achupallas to work there with the plants with the volunteer ladies. On the way we met many foreign ladies with great joy. We welcomed the opportunity to discuss many things, such as my culture, customs and traditions. After many interesting conversations we reached our destination. Achupallas community was a wonderful place full of harmony and peace and a little cooler than my community. We took our tools to work at the native plant nursery with the help of Mr. Matias, an instructor who knows a lot about plants showing us how we pick up the plants without breaking the roots and stems, put them in germination beds to then be transported to another place to continue growing. After that, they will be ready to plant in mountains at the edge of streams or they can also be planted around houses for ornamentation. Then we all worked like ants to transport the plants in a chain, we all were very happy and working well. 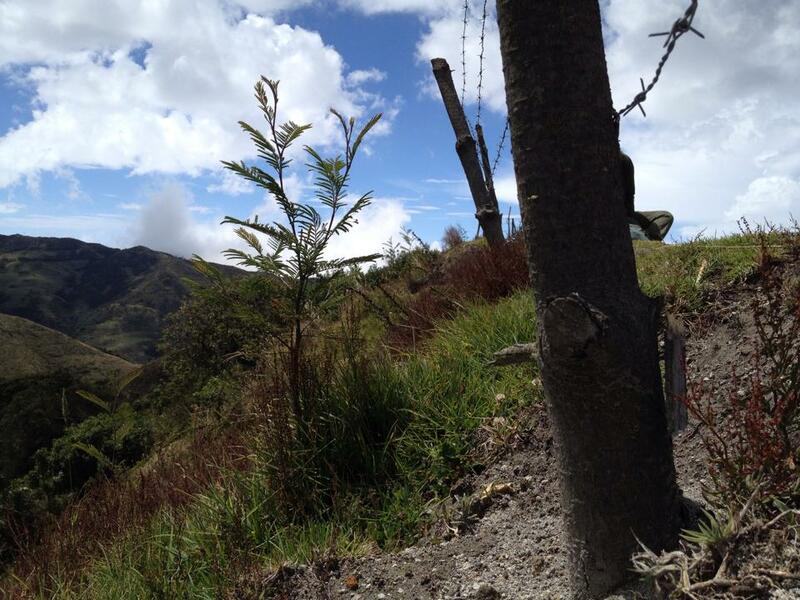 And we also planted some trees on the edge of a ravine to break the wind, which is how we take care of nature. I want to say to the gardeners thanks for caring. And when we ate lunch we had delicious empanadas and cold quinoa salad with bread and cheese, chocolates, cookies, soda and water. That was our work until noon, after that we moved on to Cuicocha, in this place I was the guide for the group of volunteers and explained about the formation of this lake, its history and some stories, such as the CHUZALONGO (story). I also explained the names of wild plants and their use. Plenty of rain accompanied us; it was very nice looking the lagoon, full of clouds and many drops of water until we had to get wet and we were very cold. 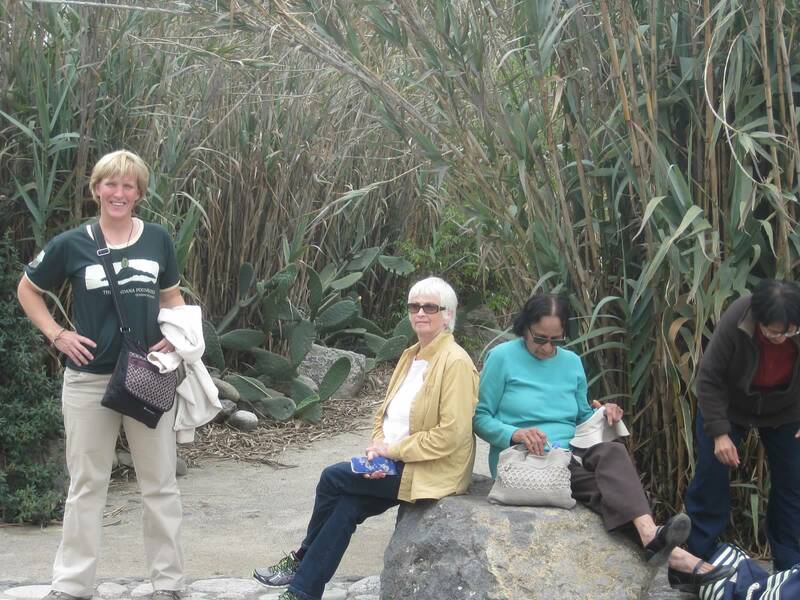 I’m sure they liked my talk, the lagoon with its beautiful landscapes, all the volunteers were very happy. That’s all for this day. After a few days, again I had the opportunity to be a guide for the same group of gardeners in Claudia Fuerez’ house, for the exhibition of medicinal plants, ornamentals, fruit trees and vegetables. They were very happy, joyful and excited to be able to learn about many plants. 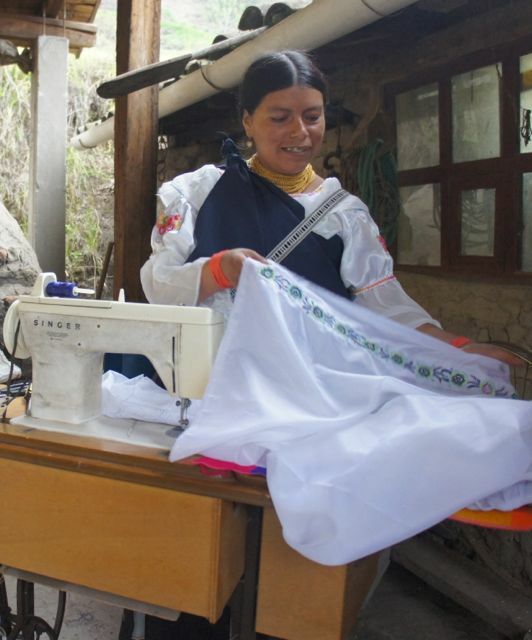 At the end of this, I showed my craftsmanship in embroidery of bags, and Otavalo blouses, napkins and tablecloths that they loved so much. Some of them bought things to wear themselves. I am an innovator in embroidery since I was very small because this is my dream since childhood to be able to embroider many wonderful things. I never had an instructor to learn, but with my own effort, dedication and imagination, I learned to do excellent work. But I never thought you would be interested in my crafts, so at this time I want to say thank you very much for the appreciation and the support of my talent. Thanks Anita Taft and Tandana Foundation, I really appreciate it, groups of gardeners, volunteer doctors, assistants and student volunteers. Thanks for your visit and activities in my beautiful country Ecuador. This is very important for us, I hope you return soon. 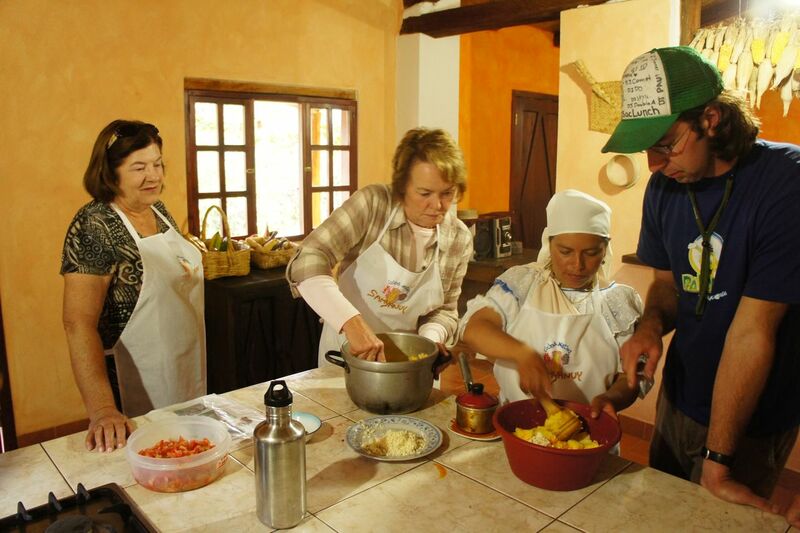 Remember that Ecuador is a wonderful country; you can find many magical places and very delicious cuisine. You also have the opportunity to share with friendly and innovative people. 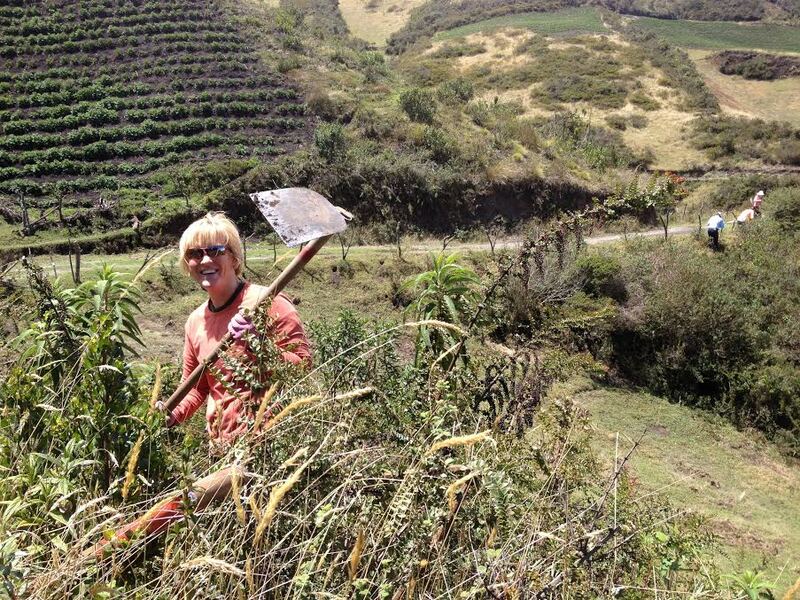 Bonjour les amis, je suis Cristina Fuerez d’Otavalo – Equateur et je veux partager une très belle expérience que j’ai eue avec vos jardinieres dans le mois de Février 2013. Très tôt un matin pluvieux, nous sommes allés avec ma sœur Marguerite de notre village au village de Achupallas pour y travailler avec les plantes avec les dames bénévoles. Sur le chemin, nous avons rencontré beaucoup de femmes étrangères avec une grande joie. Nous nous félicitons de l’occasion pour discuter de beaucoup de choses, comme ma culture, les coutumes et les traditions. Après de nombreuses conversations intéressantes, nous avons atteint notre destination. La communaute d’Achupallas était un endroit merveilleux plein d’harmonie et de paix et un peu plus frais que ma communauté. Au moment où nous avons pris nos outils pour travailler à la pépinière de plantes indigènes avec l’aide de M. Matias, comme un instructeur qui sait beaucoup de choses sur les plantes qui nous montrait comment nous obtenons les plantes sans casser les racines et les tiges, les mettre dans des lits de germination pour être ensuite transporté dans un autre lieu pour continuer à croître. Après cela, ils seront prêts à planter dans les montagnes au bord du cours d’eau ou ils peuvent également être plantés autour des maisons pour l’ornementation. Ensuite, nous avons tous travaillé comme des fourmis pour transporter comme une chaîne des plantes, nous étions tous très heureux et ca fonctionnait bien. Et nous avons aussi planté quelques arbres sur le bord d’un ravin à briser les vents, ce qui est la façon dont nous prenons soin de notre nature. Je tiens à dire aux jardinieres merci pour s’inquiéter. Et quand nous avons mangé le déjeuner, nous avions délicieuses empanadas et salade de quinoa froid avec du pain et du fromage, des chocolats, des biscuits, des boissons gazeuses et de l’eau. C’était notre travail jusqu’à midi, après quoi nous avons déménagé à Cuicocha, dans ce lieu j’ai été le guide pour le groupe de volontaires et a expliqué à propos de la formation de ce lac, son histoire et des histoires, comme le CHUZALONGO (histoire). J’ai aussi expliqué les noms des plantes sauvages et leur utilisation. Beaucoup de pluie nous a accompagné, il a été très agréable à regarder le lagon, plein de nuages ​​et de nombreuses gouttes d’eau jusqu’à ce que nous avions à se mouiller et nous étions très froid. Je suis sûr qu’ils ont apprécié mon discours, la lagune avec ses beaux paysages, tous les bénévoles étaient très heureux. C’est tout pour ce jour. Après quelques jours, encore une fois, j’ai eu l’occasion d’être un guide pour le même groupe de jardinieres a la maison de Claudia Fuerez, pour l’exposition des plantes médicinales, des plantes ornementales, arbres fruitiers et des légumes. Ils étaient très heureux, joyeux et heureux d’être en mesure d’apprendre de nombreuses plantes. A la fin de cela, j’ai montré mon savoir-faire de la broderie de sacs et chemisiers Otavalo, serviettes et nappes qu’ils aimaient tant. Certains d’entre eux ont acheté des choses à se porter. Je suis un innovatrice dans la broderie depuis que je suis toute petite parce que c’est mon rêve depuis l’enfance de pouvoir broder beaucoup de choses merveilleuses. Je n’ai jamais eu un instructeur pour apprendre, mais avec mon propre effort, de dévouement et d’imagination, j’ai appris à faire un excellent travail. Mais je n’ai jamais pensé que vous seriez intéressé par mes métiers, alors cette fois je tiens à vous dire merci beaucoup pour la reconnaissance et le soutien de mon talent. Merci Anita Taft et la Fondation Tandana, je l’apprécie vraiment, des groupes de jardiniers, les médecins bénévoles, assistants et étudiants bénévoles. Merci pour votre visite et activités dans mon beau pays Equateur cela est très important pour nous, j’espère que vous reviendrez bientôt. Rappelez-vous que l’Équateur est un pays merveilleux, vous pouvez trouver de nombreux lieux magiques et une cuisine délicieuse. Vous avez également la possibilité de partager avec des gens sympathiques et innovantes.